My first view of Istanbul was at dawn through the bleary eyes. We had just taken an overnight bus from central Turkey. Sometimes buses are overheated, sometimes they are freezing cold. This one happened to be both, with the heater on full blast at the feet and the air conditioning blowing from above. All night I wished I could perform some advanced yoga moves to help me find the perfect temperature balance. 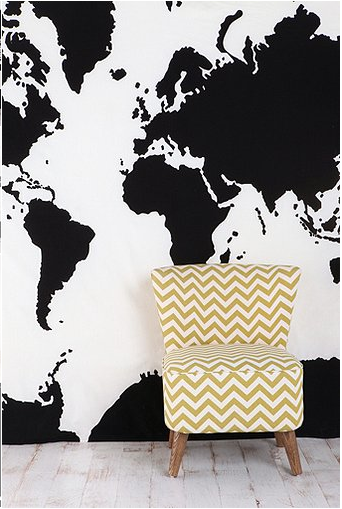 I imagine this would involve one foot sticking straight up while the other is crossed behind my head. I tried but alas I’m not that flexible. 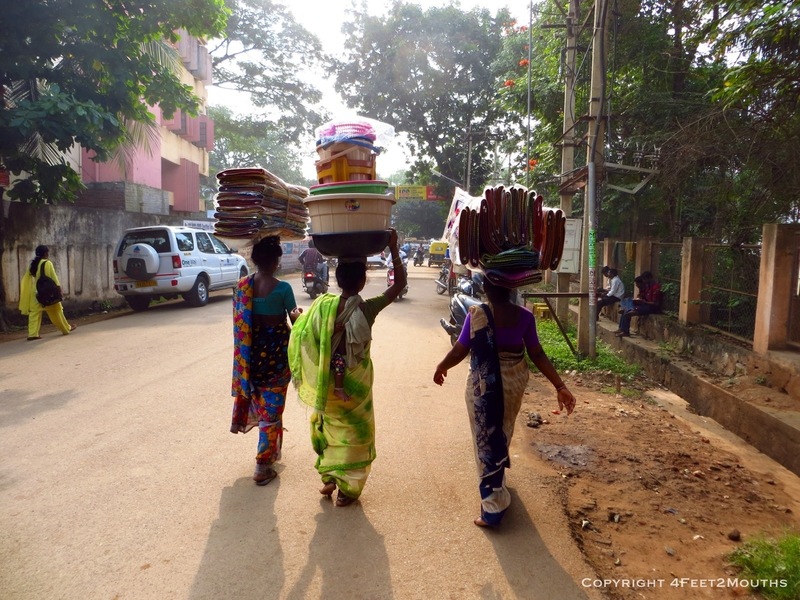 Upon arrival, the sights and sounds of the city were enough to give me a pick me up on the way to the hostel. 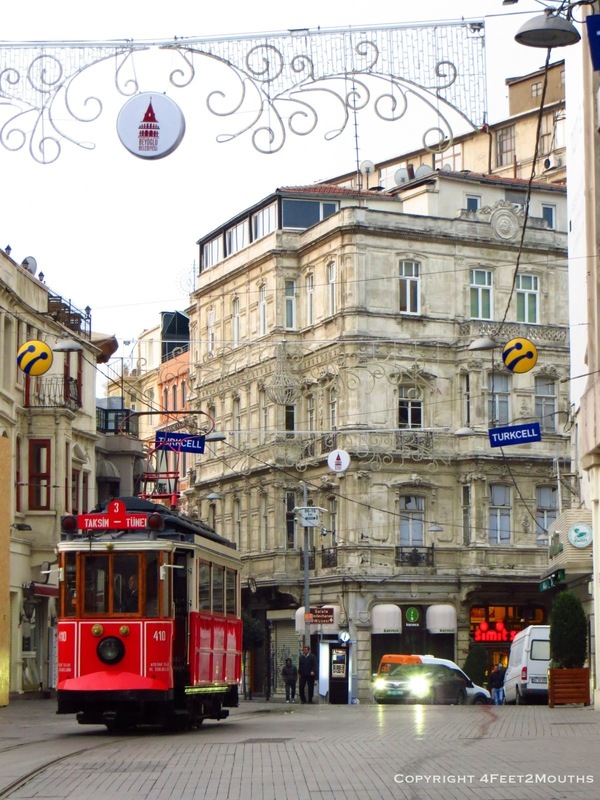 I had been looking forward to Istanbul for a while so we wasted no time in getting to the old town. First stop: Hagia Sophia. 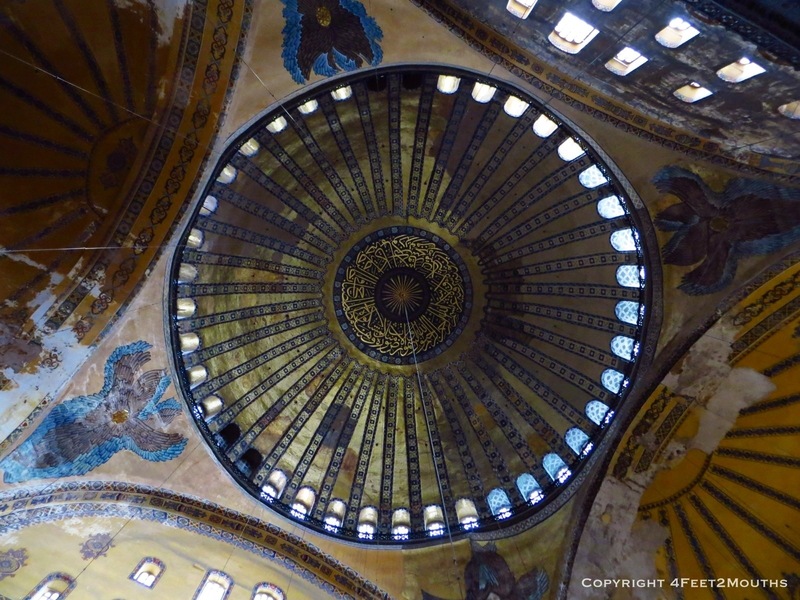 The Hagia Sophia was one of the most magnificent buildings I have ever seen in my life. Stunning. Jaw dropping. And it was built in the 500s(!!!) by the Roman emperor Justinian. I am so happy that this incredible piece of architecture survived the past 1500 years intact. In order to do so it had to change with the times. For its first 1000 years it was a Christian church. But when the Ottomans came they brought Islam with them. The building was converted to a mosque. 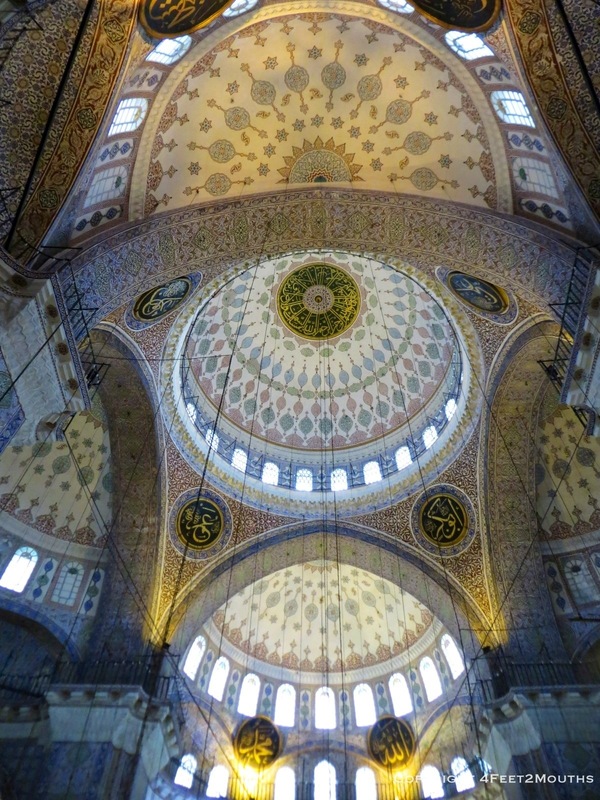 The most notable additions were large chandeliers hanging from the ceilings, huge disks with Arabic calligraphy and a mihrab showing the direction of Mecca. Fortunately, the conversion to a mosque did not demolish the Christian art already in place. 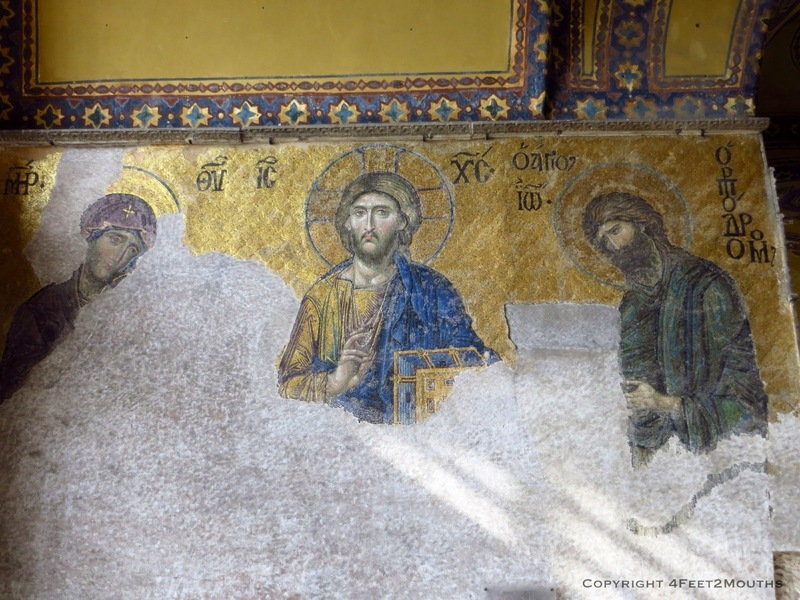 Gold mosaics of Jesus, Mary and saints are still present. 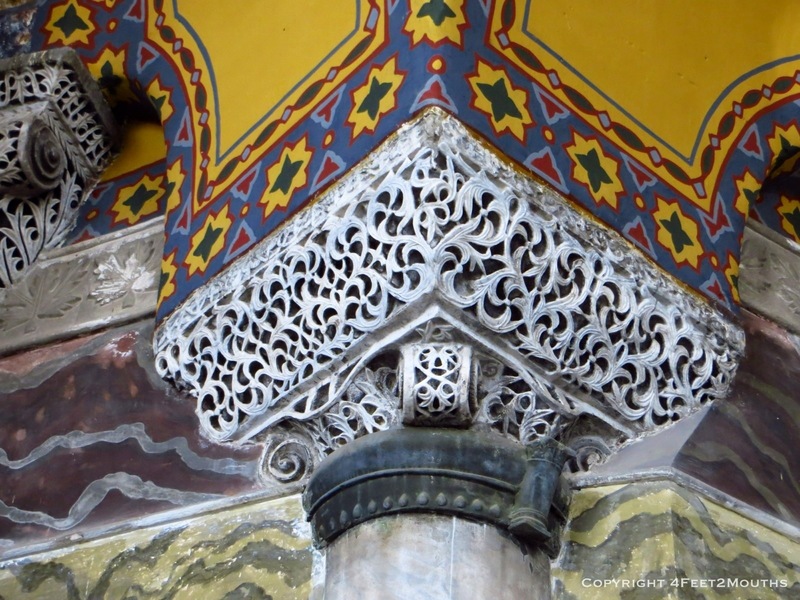 Other original details such as the marble column capitals engraved with Justinian’s crest are also there. 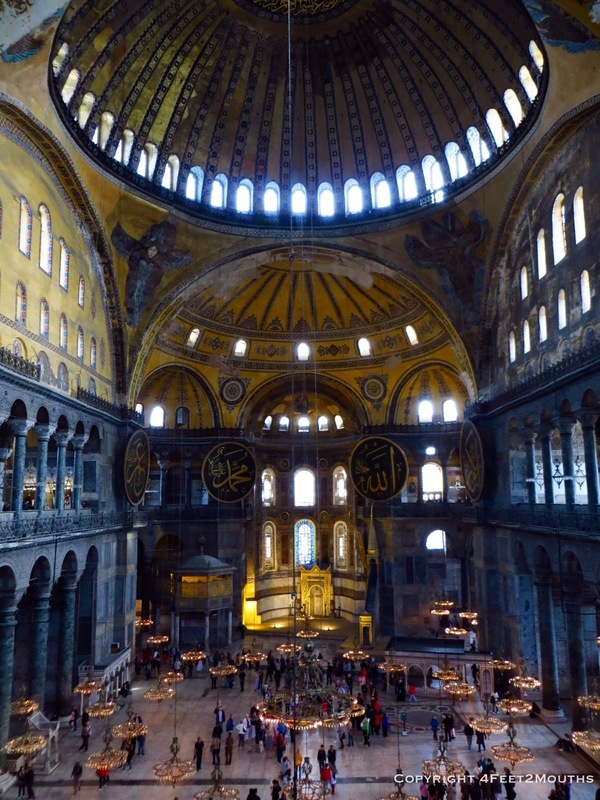 In the early 20th century the Hagia Sophia was converted into a museum to earn money for preservation efforts. 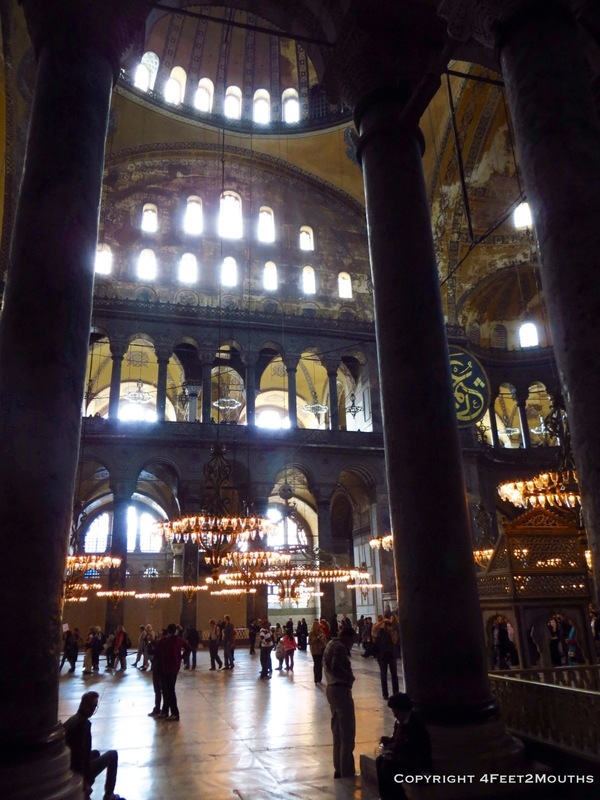 Supposedly, Sultan Ahmet I wanted to outdo the Hagia Sophia. 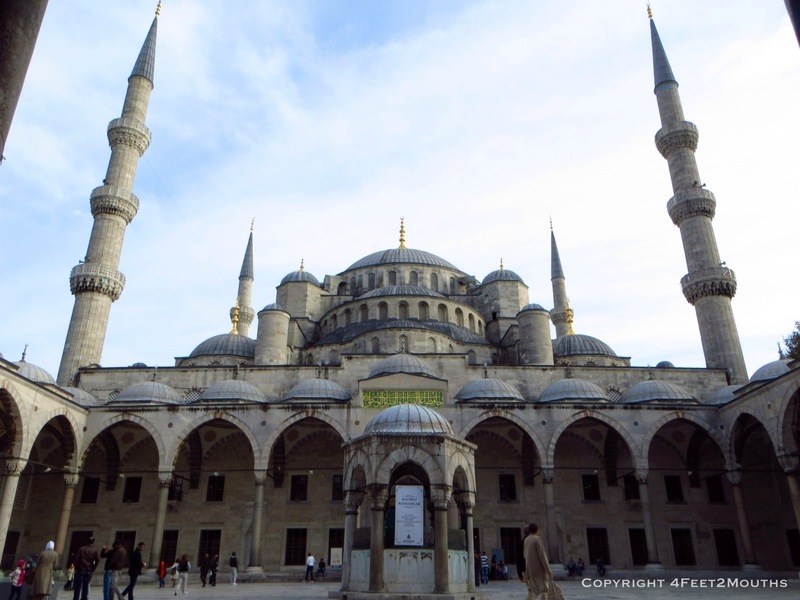 Thus, the Blue Mosque was created very close to it. 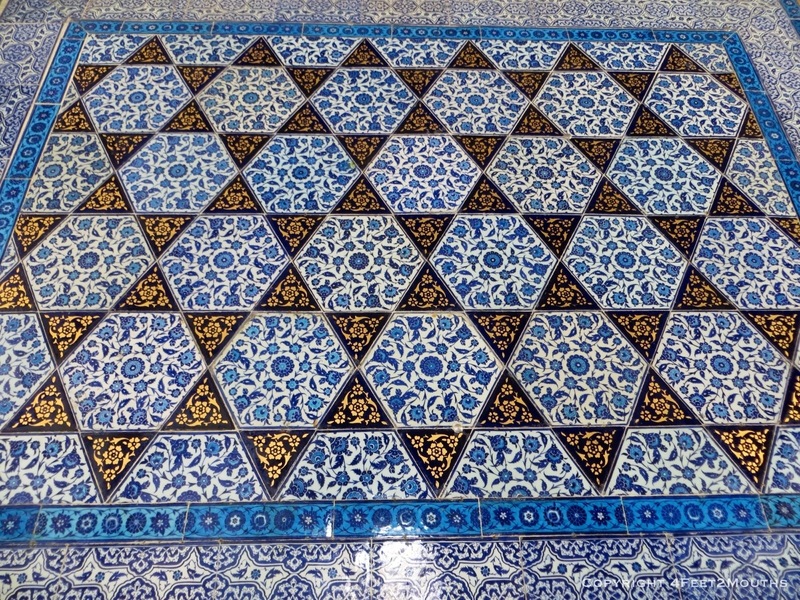 Overall, he succeeded with the exterior which has a harmonious symmetry. The inside is also grand but not quite as impressive as its much older neighbor. Just across the street was a special surprise, the roman cistern. At first I thought, “what is going to be so special about a big water storage basin?” But as I descended the stairs to go below street level I realized it was much more. 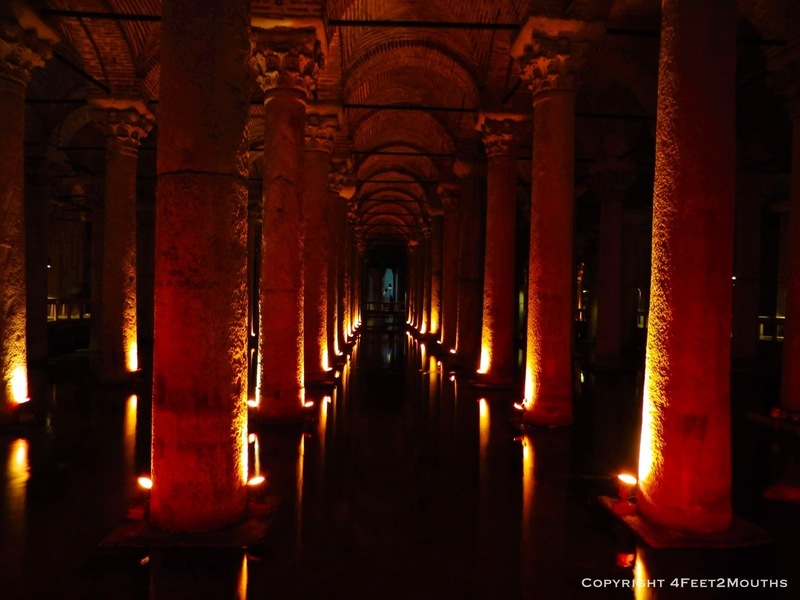 Columns taken from other already ruined temples were used for this utilitarian space meant simply to hold water. 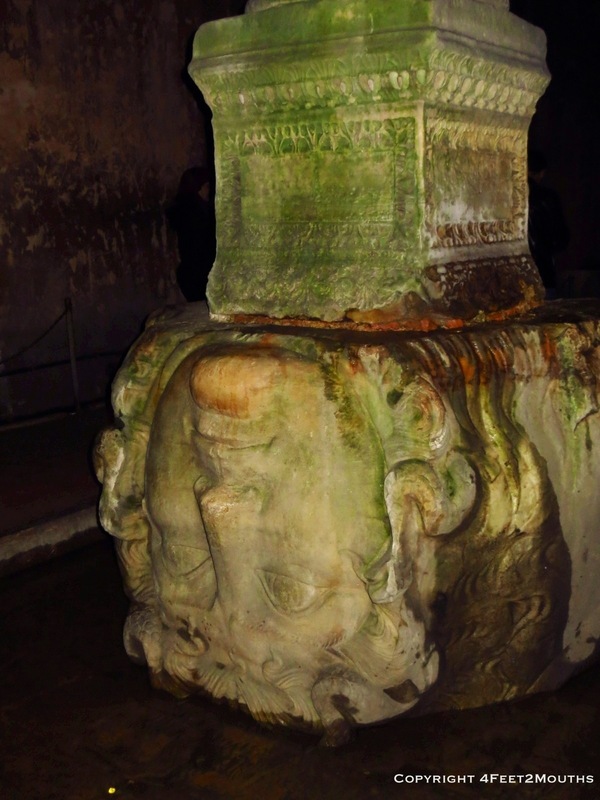 That’s how a giant Medusa head ended up as a simple column base. But they put her upside down just to make sure she couldn’t cast her deadly stare. Another highlight of Istanbul is the Grand Bazaar. 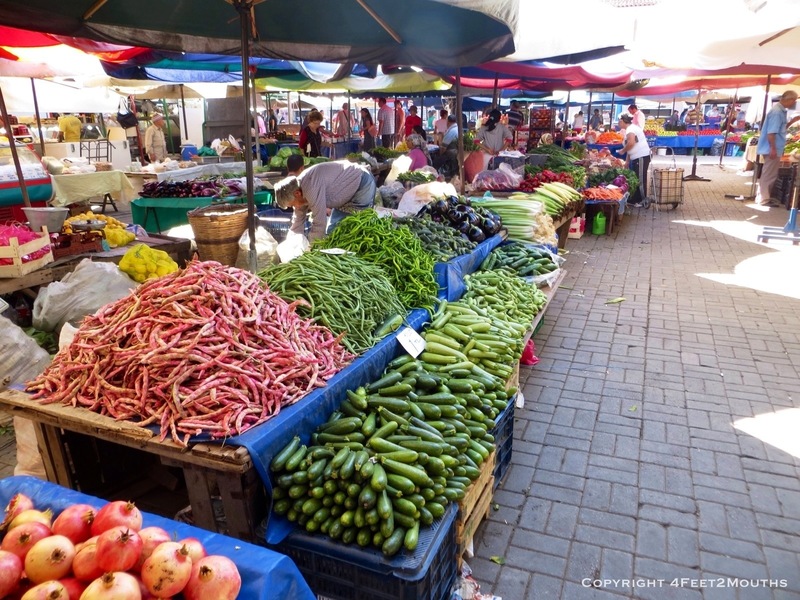 It is a 600 year old labyrinth of food and market stalls selling carpets, trinkets, jewelry, clothes, textiles, pottery and pretty much everything you could want. Nathan and I were extremely excited to explore every last nook and cranny. But we didn’t get to see any of it. We had been told that the October 25 was an important Muslim holiday. It is the day that Abraham was to demonstrate his devotion to God by sacrificing his own son. However, God allowed him to sacrifice a goat. However, no one mentioned that everyone would also be off the for the four days following the holiday. Therefore, many of the shops, eateries and the entire Grand Bazaar were closed for basically our entire stay. Now we have a reason to return. So how does one drown their sorrows in a city that has high alcohol tax to discourage drinking? Eat more baklava. 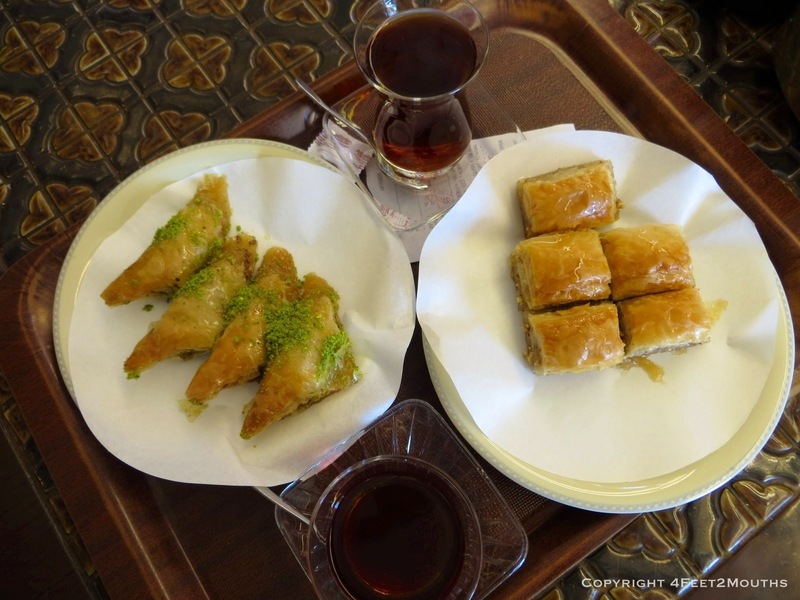 We sampled from several baklava shops. The first was Hafız Mustafa Şekerlemeleri in the old city. 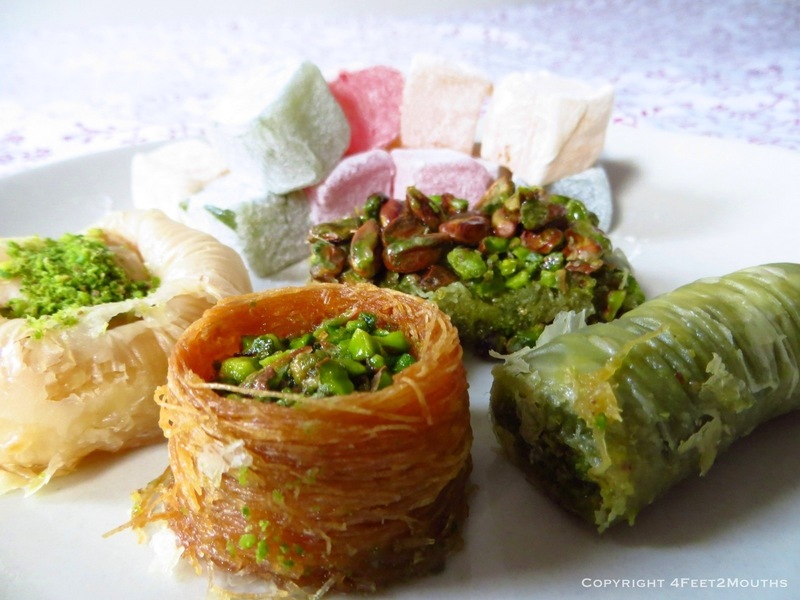 We couldn’t resist the trays of baklava variations backed up by mounds of Turkish delight. I happily bought a box to go for a midnight snack at our hotel. It was delicious, but not quite as delicious as Karaköy Güllüoğlu. 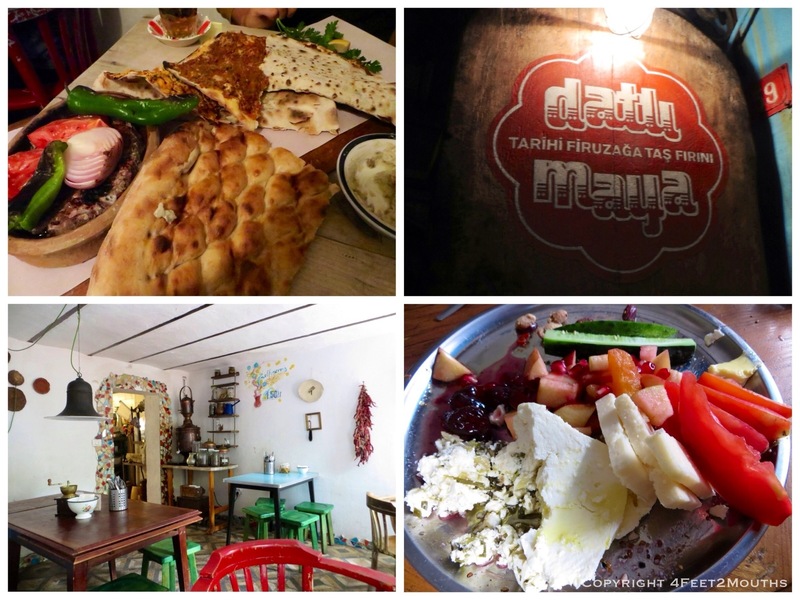 This place, across the river in the Beyoğlu neighborhood makes magic. The walnuts and pistachios were freshly roasted and dripping in a persimmon simple syrup. The baklava made me feel better. And truth be told not everything was closed. 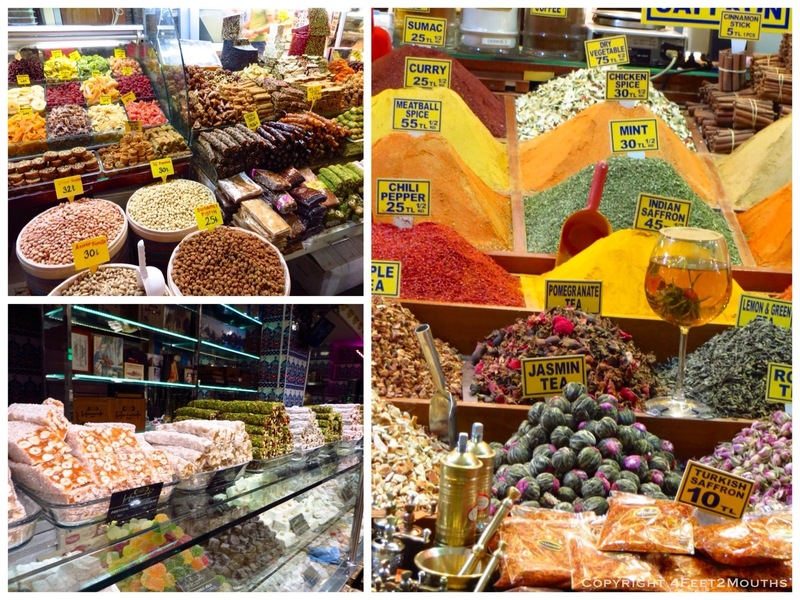 For example, we still made it to the spice bazaar. Yes, it’s touristy but the piles of spices, teas and sweets housed in a 400 year old market building are still fun. 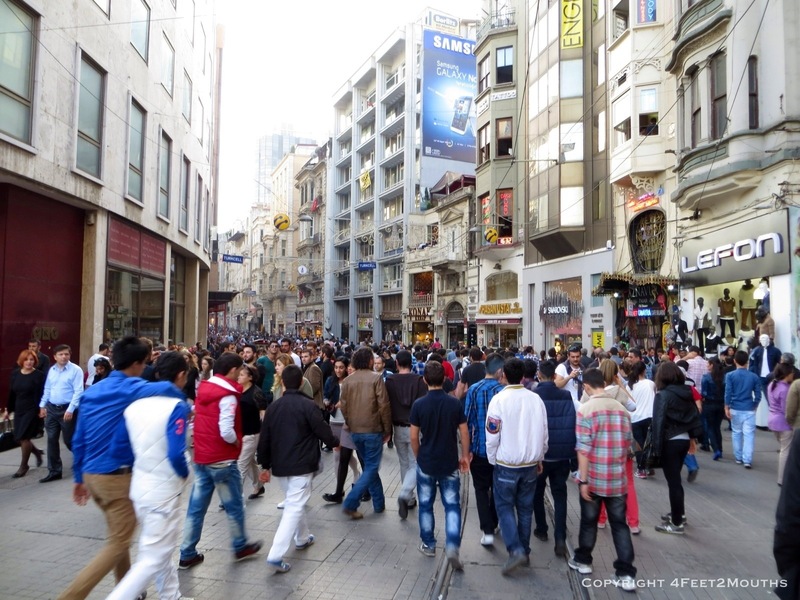 However, the real action was on İstiklal, a major shopping thoroughfare that is largely pedestrianized. 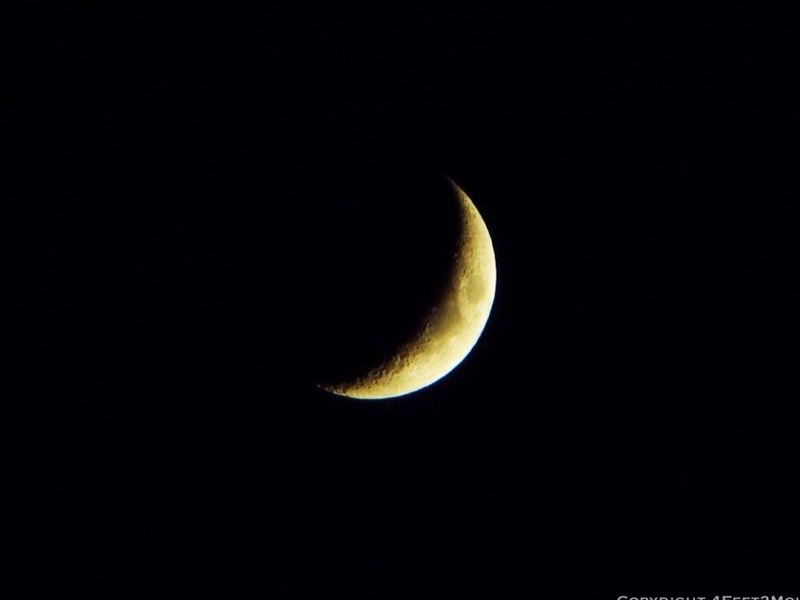 Thousands of people could be found strolling up and down from midday to late night. Fortunately the ferry cruises were still running so we caught one to take a ride up the Bosporus. 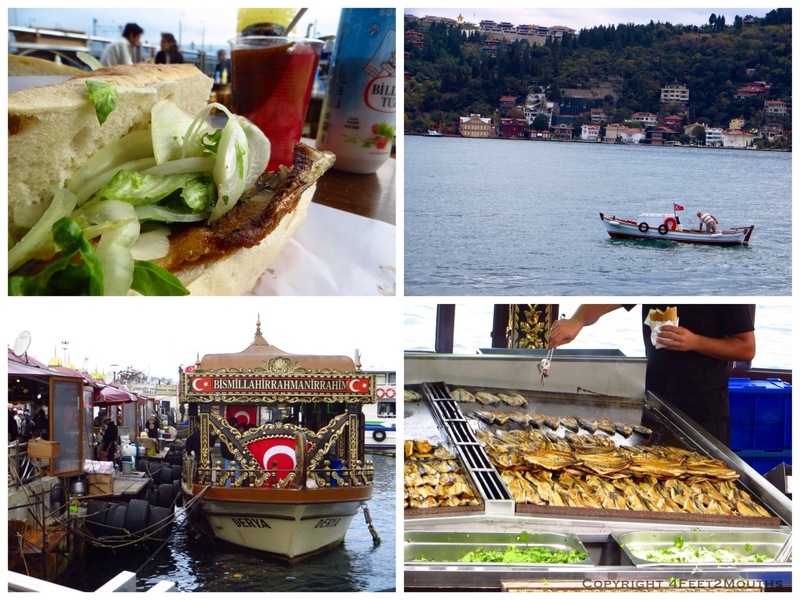 We followed up with a balık ekmek (fish sandwich) near the dock. 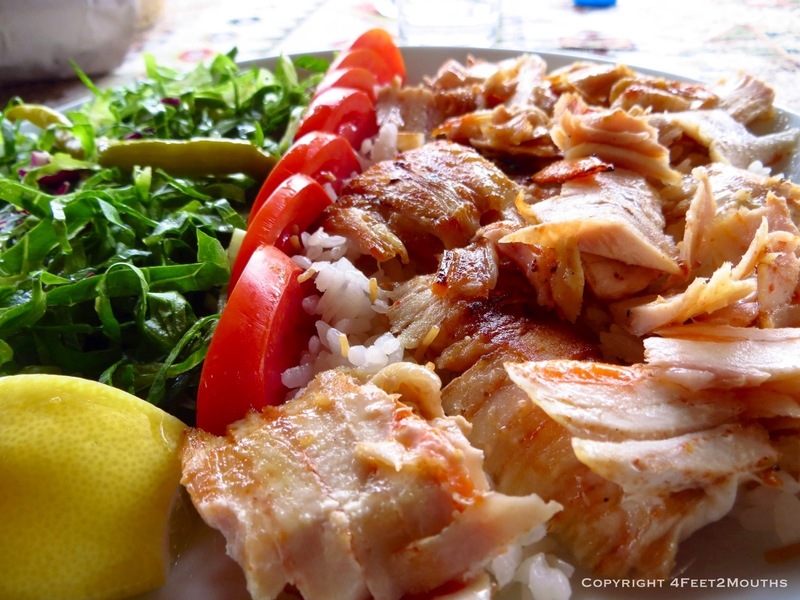 Crispy fish is fried up on small boats, stuffed in some bread with onions and handed over for 5 Turkish lira, about $2.50. It’s up to you to douse it with as much lemon sauce as you want. We bought some cucumbers pickled in turnip juice to accompany our quayside meal. The fish sandwich whet our appetite for more street food. For ideas we turned to Anthony Bourdain. 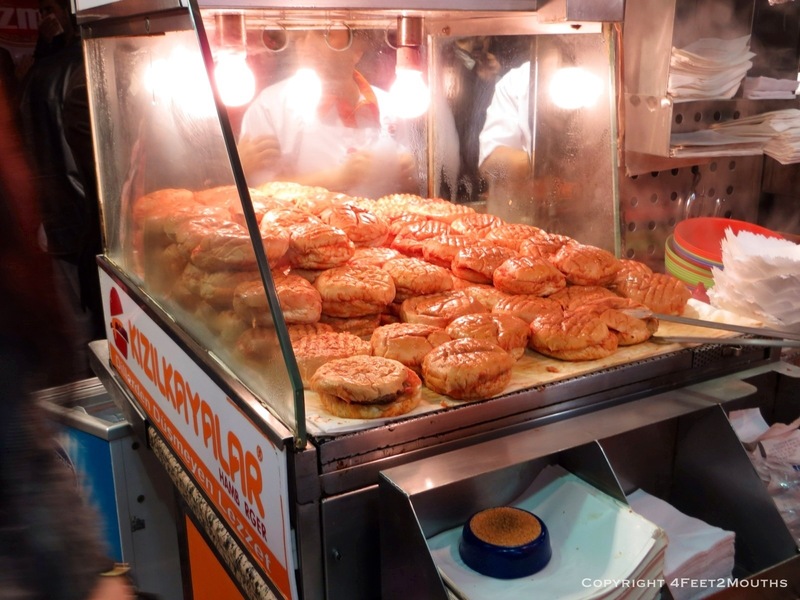 His trip to Istanbul included a late night snack at Kizilkayalar to eat their famous wet burger. We followed suit and found a crowd huddled around the “burger hammam”. Hammams are the Ottoman era public baths/spas. The name burger hammam makes me smile thinking of burgers wrapped in white towels lounging in a sauna. Perhaps they didn’t have towels but they were definitely steaming in their street side case. The burgers were warm and fluffy with a tomato based sauce. Seriously worth the 2 lira. Other popular street food snacks were roasted chestnuts, corn, steamed mussels and popcorn. 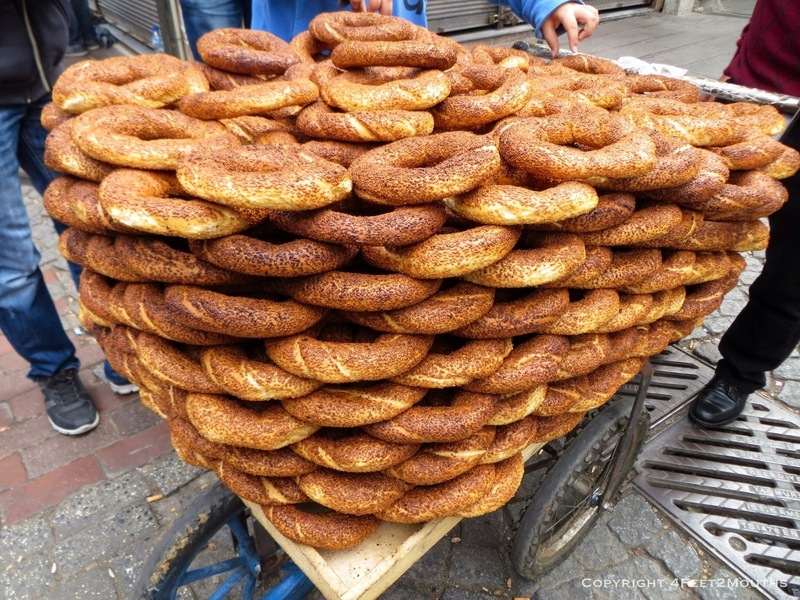 But when we wanted something to nibble we most often reached for simit, a toasted, sesame crusted bread ring. Dürüm, a simple Turkish wrap of barbecued meats filled our late night cravings. Especially the fine example at Dürümzade. Despite the holidays, the mosques were still open to visitors. 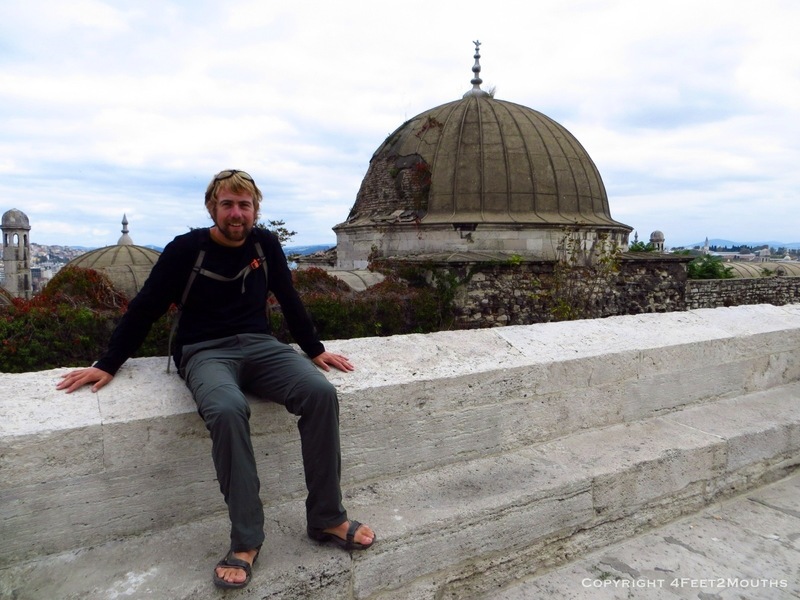 High up on a hill we explored the Süleymaniye mosque. 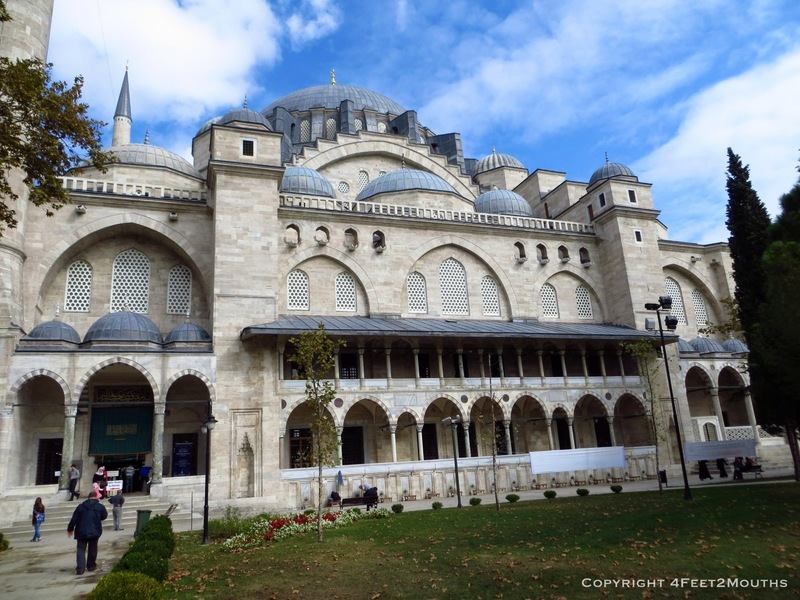 A little younger than the Blue Mosque, it was just as grand and elegant. 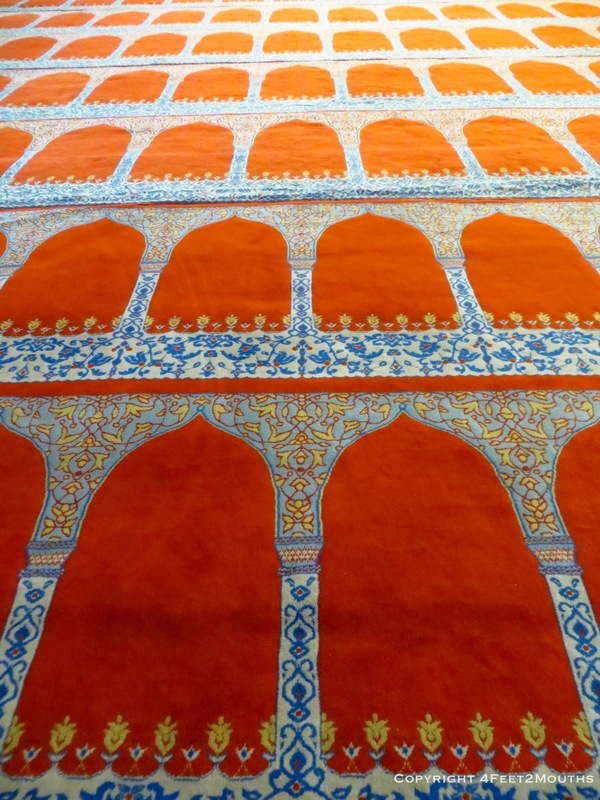 Inside the mosque, the carpet clearly delineates where people should kneel to pray. 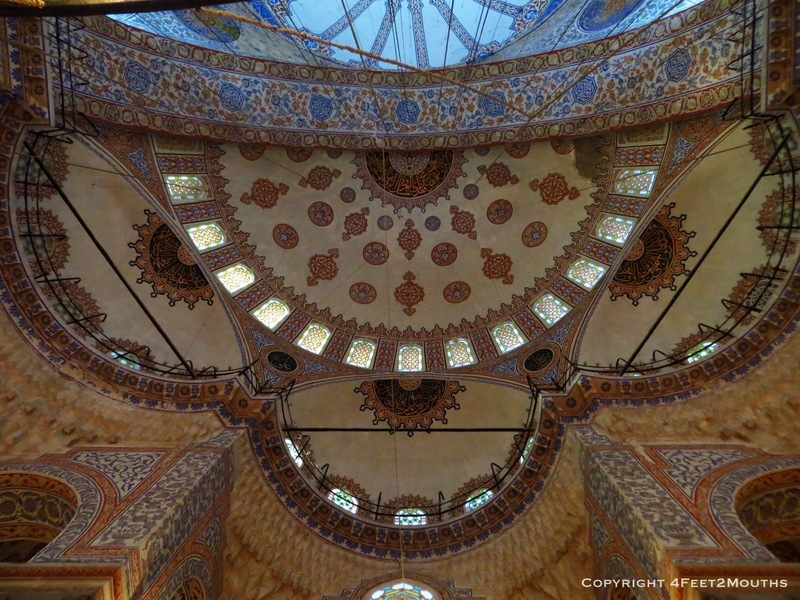 The same is true at nearby Rüstem Paşa Mosque which was much smaller but adorned with intricate tile work. 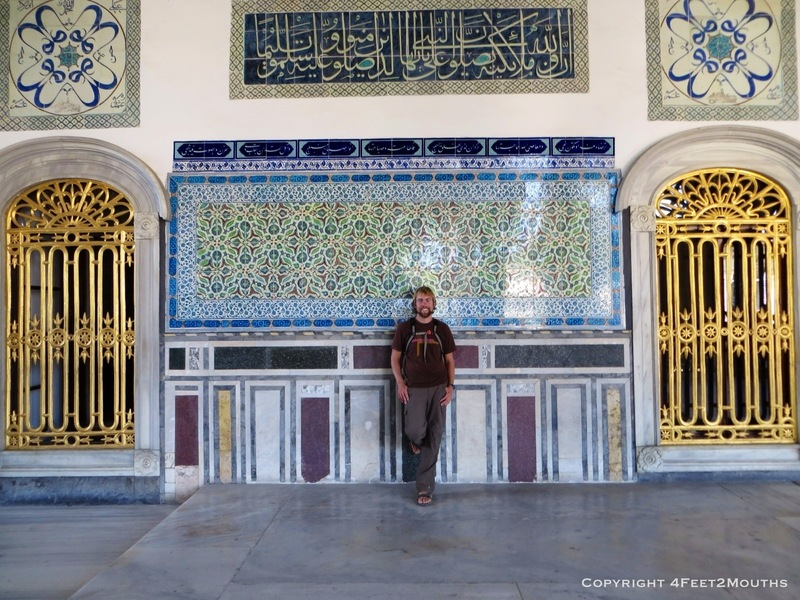 There was one more major sight on our list, Topkapı Palace. This huge complex is the Ottoman version of the Forbidden City. Access to the lavish courtyards was once confined to the royal family and their closest advisers. 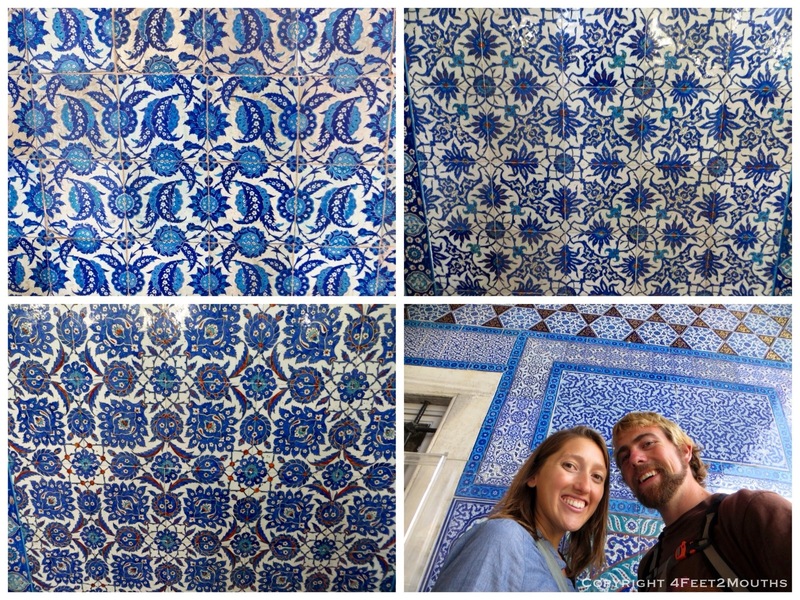 Now, tourists explore the grounds oohing and ahhing at the spectacular tile work and gold leafing. 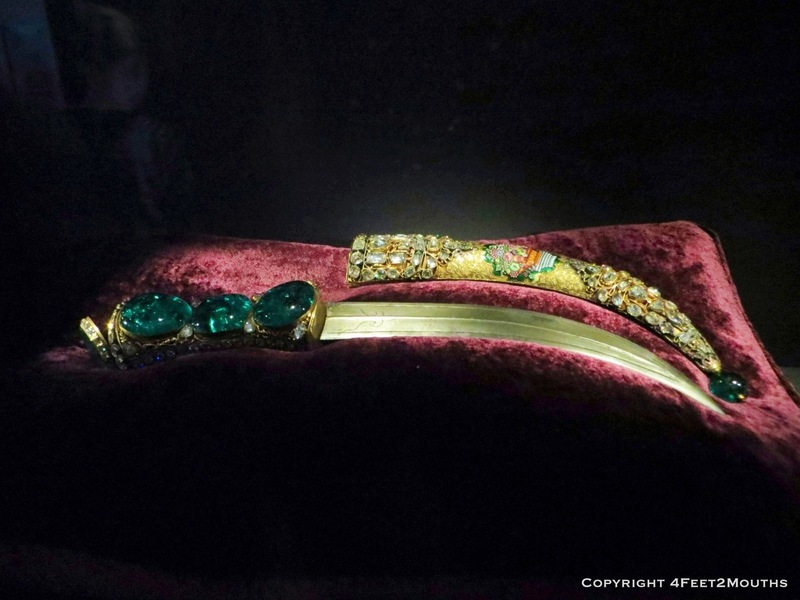 The greatest crowd reaction is probably in the treasure room where you can find enormous and dazzling emeralds, rubies and diamonds encrusting everything from cups to daggers. During our stay in Istanbul Nathan and I celebrated a very special holiday of our own, our anniversary. 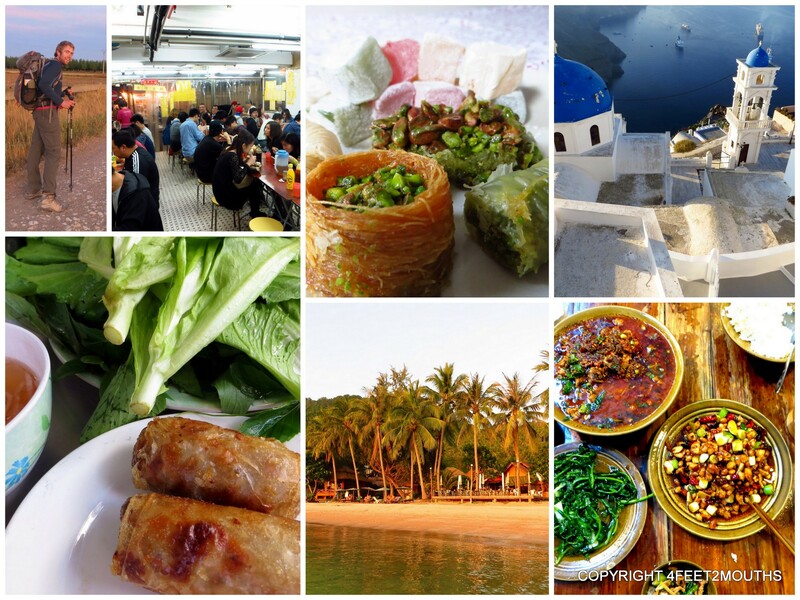 We hoped to find a romantic but laid back place that served delicious food. 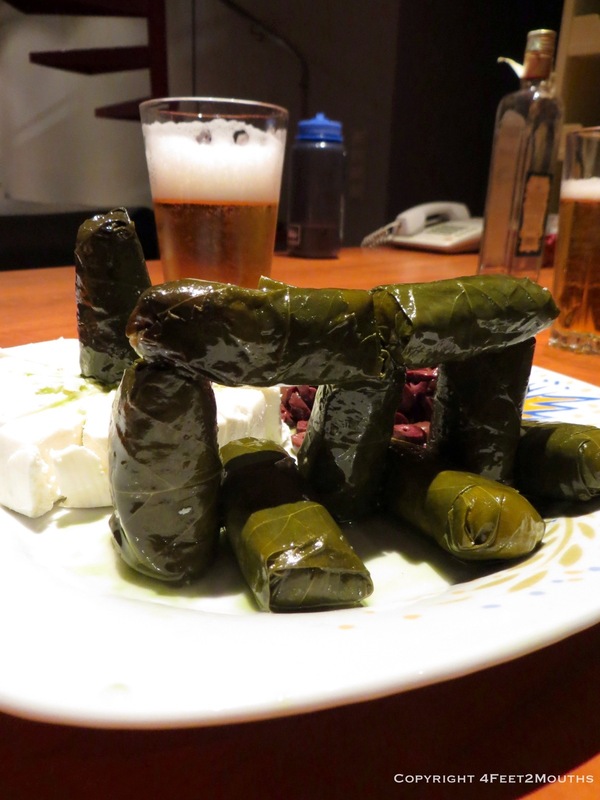 Fortunately we succeeded on all fronts after scrolling through recommendations on the excellent food blog, Istanbul Eats. 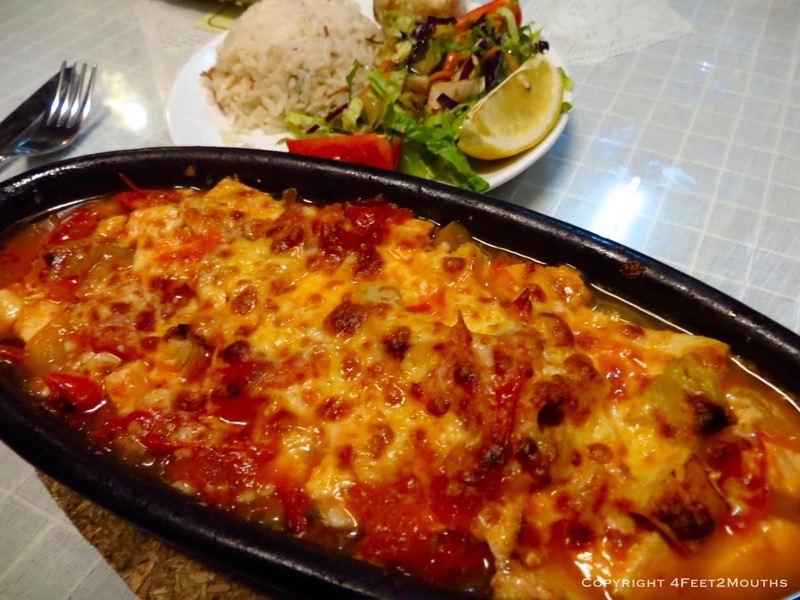 Our dinner at Datli Maya featured an incredibly moist kebab baked in a clay dish. We ordered a side of roasted eggplant dip and a couple of lahmacun (crispy, thin flatbreads with toppings). Most of our meal had been baked in the large wood fired oven that dominates the ground floor. It was comfort cooking taken a step further by a chef that knows how to add a special touch. We enjoyed our meal so much we decided to have breakfast there as well. A buffet of crunchy cucumbers, fresh tomatoes, three types of cheese, jams, butter, sesame sauce and fruit salad was spread out in front of us. Of course, this was accompanied by a mix of freshly baked sweet and savory breads. I had a feeling I’d like Istanbul. But as it turned out, I loved it. The city commands your senses – your eyes are drawn to beautiful domes, your nose fills with the aroma of spices, and your taste buds can’t get enough sweets. 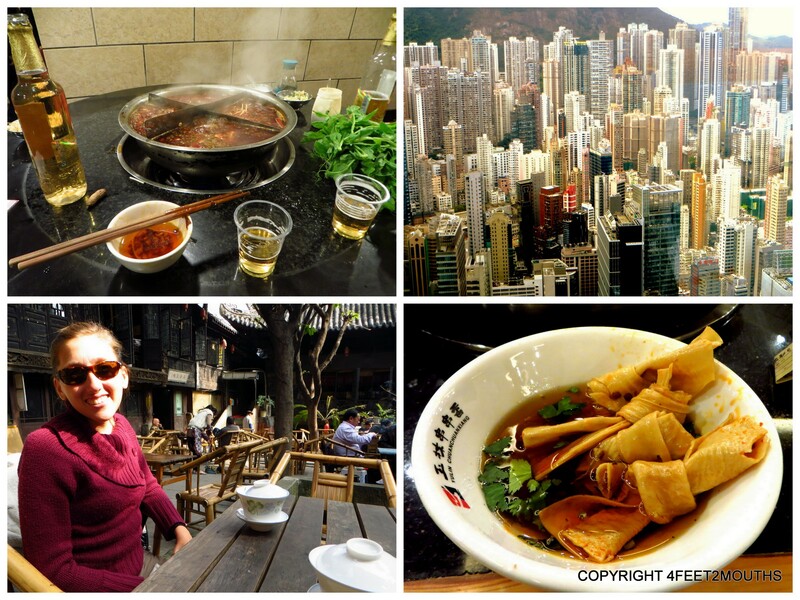 The architecture, food and culture are a beautiful mix of European and Asian influences. 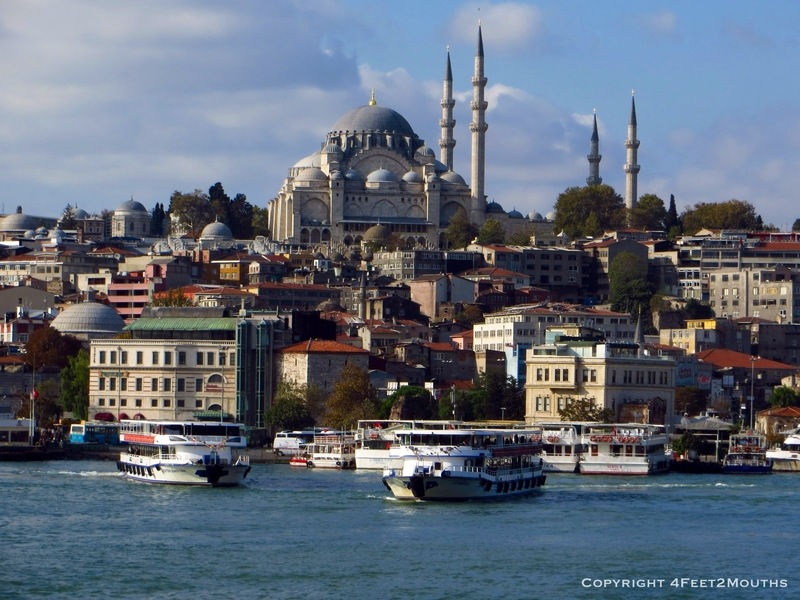 Indeed, Istanbul is a true Turkish delight. Want to see a place that is magical, astonishing and entirely unbelievable? 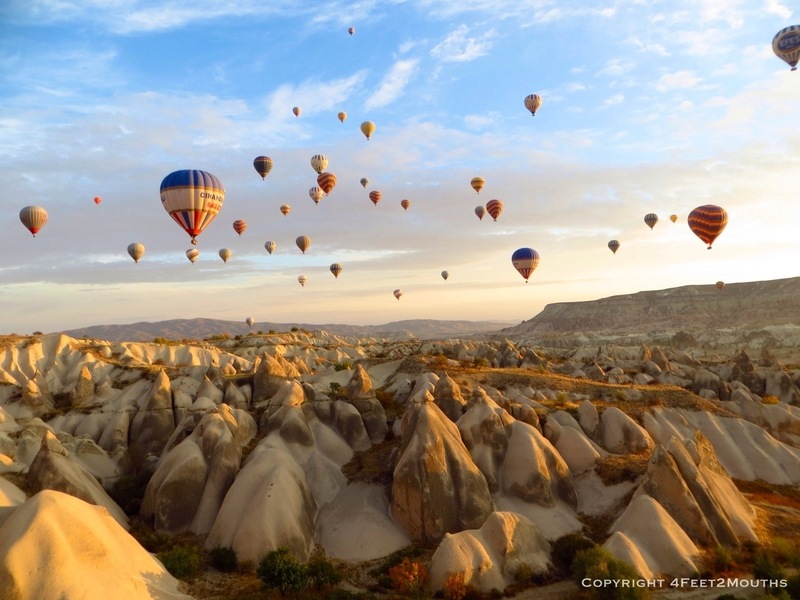 Visit Cappadocia in central Turkey for one out-of-this-world experience. 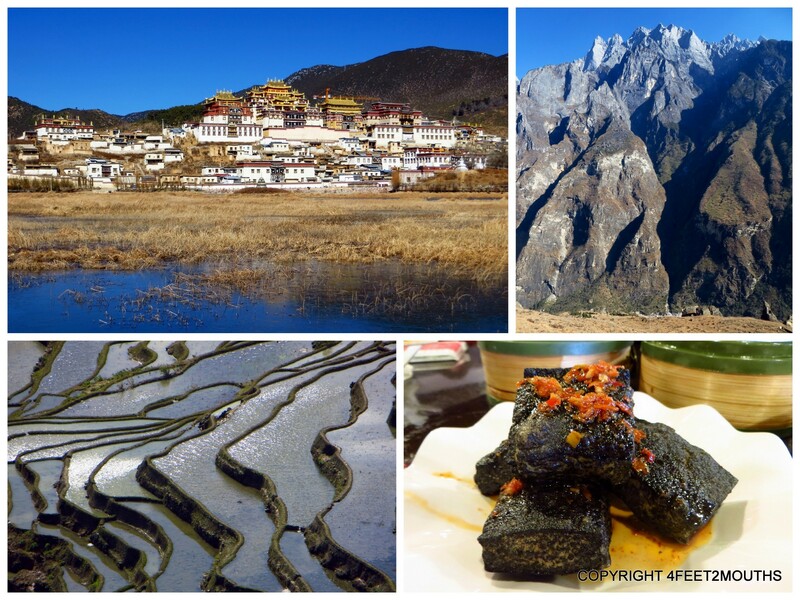 Spectacular land formations converge with exemplary culture for an experience of a lifetime. 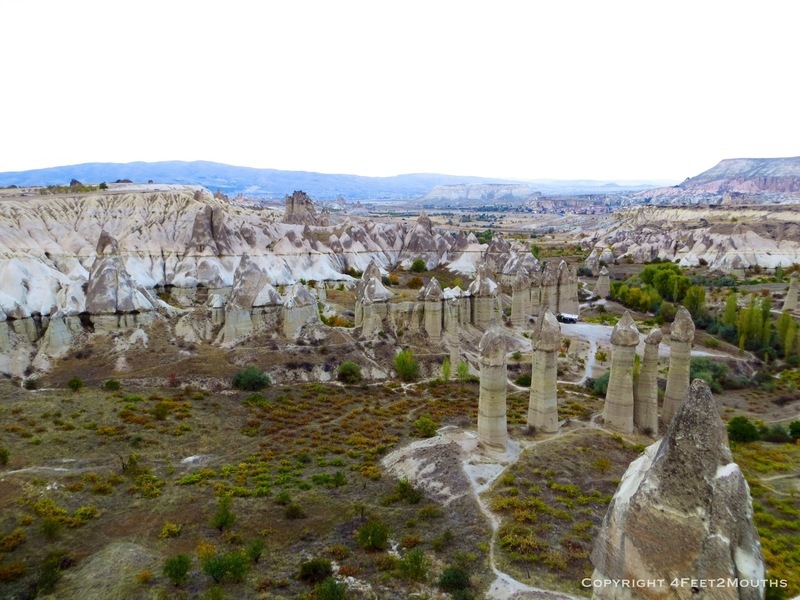 We landed in the city of Göreme from Selçuk on one super long bus ride that passed through Ankara. 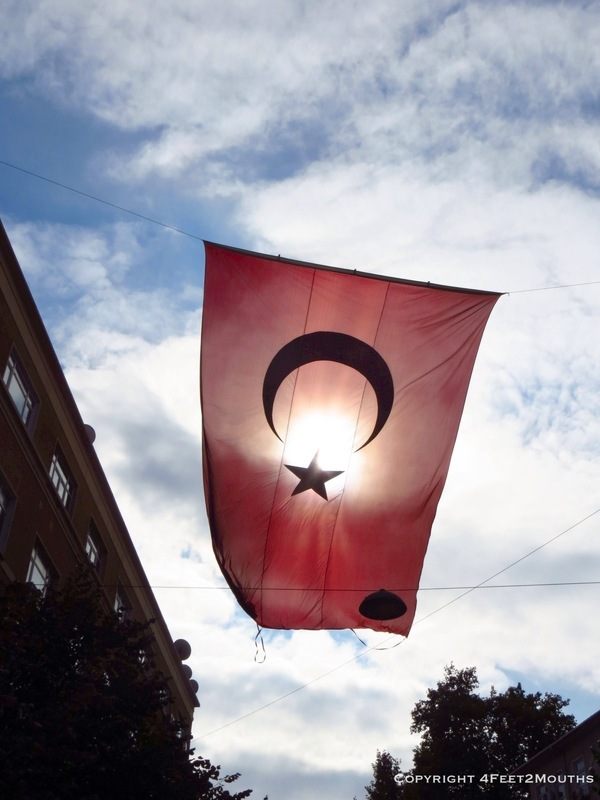 It is difficult to know all major holidays while traveling, but our time in Turkey coincided with one of the largest Muslim holidays of the year, Eid al-Adha. 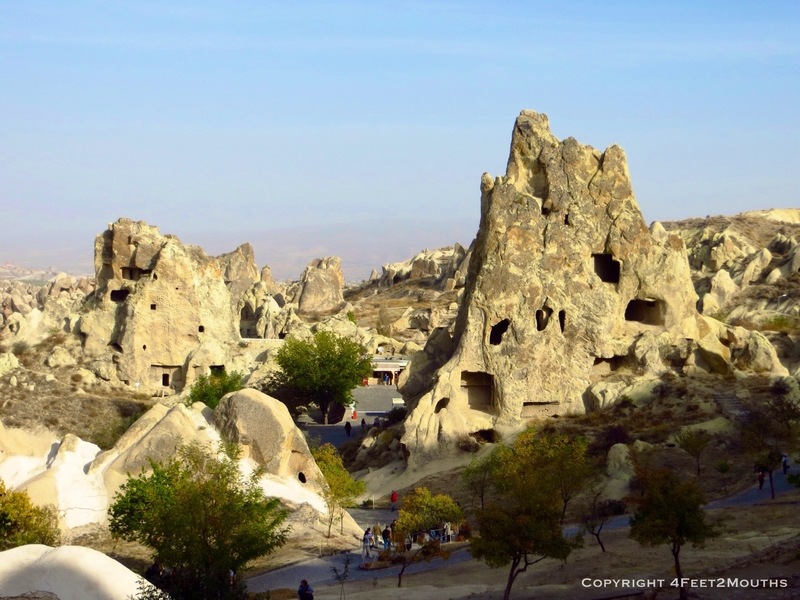 Thus busses were booked and we added an extra four hours of travel time just to get to Cappadocia. 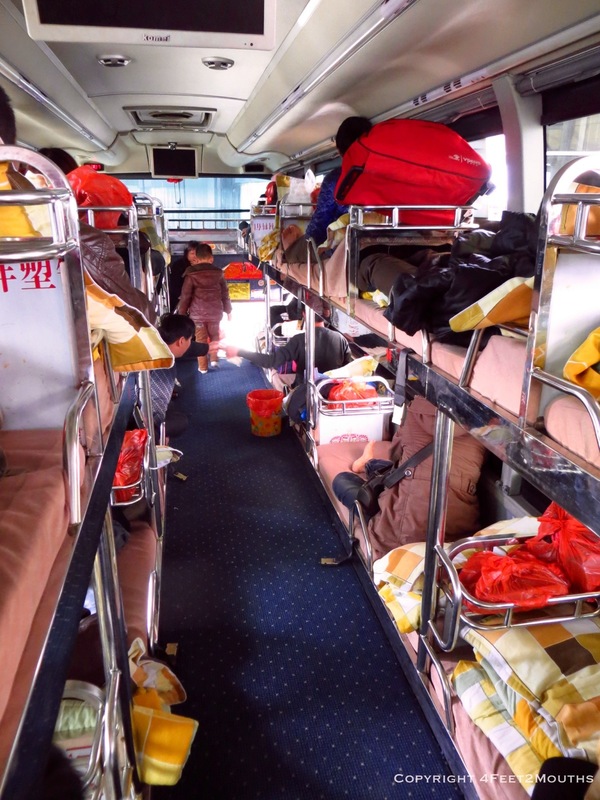 When we finally did arrive, we staggered out of the mini bus completely in awe. Enormous cones of rock scattered the landscape. 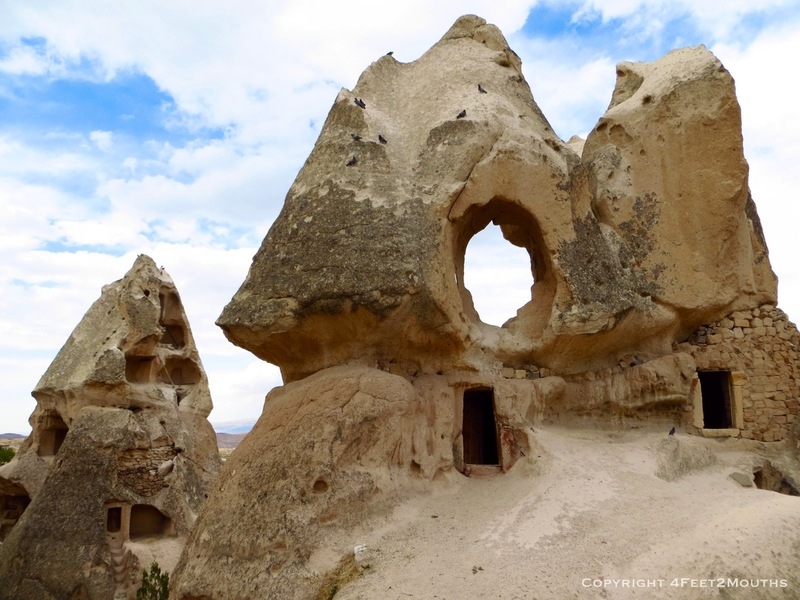 Each miniature mountain had been hollowed out with windows, rooms, and elaborate entrances. Everywhere we looked was a cave home or cave hotel towering over the city. We explored the city for a short while, but our afternoon ended quickly as the clouds closed in overhead and our daylight disappeared. For dinner found a cozy restaurant with some pide (Turkish style pizza) and clay pot roast. We awoke in the dark. Despite our desire to sleep in, we were eager to climb to the Göreme lookout point. 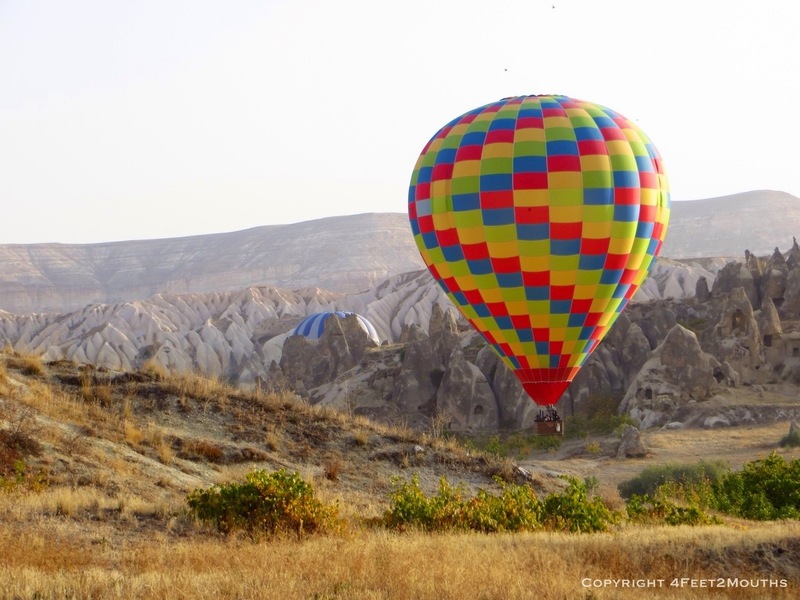 We ascended to the ridge to discover eighty hot air balloons preparing for take off. There was a silence in the air that was broken by scattered rough coughs of enormous torches heating the gigantic balloons. In the faint light the balloons slowly rose from the canyon. They drifted into the air and above the horizon. The colors and designs of each balloon varied- there were stripes, checkerboards, rings, flags and advertisements decorating the orange sky. 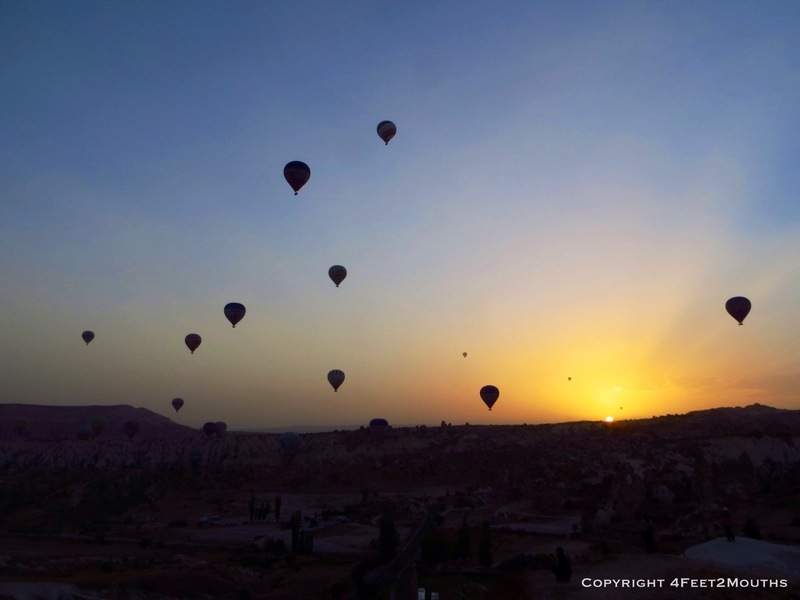 The sun peaked over the mountain ridge in the distance and the balloons rose higher and higher. After an hour of flight the balloons steer themselves to an opposite canyon and land effortlessly on trailers waiting for them. The balloon travelers viewed the drastic landscape from the sky, but we wanted to explore the canyons on foot. 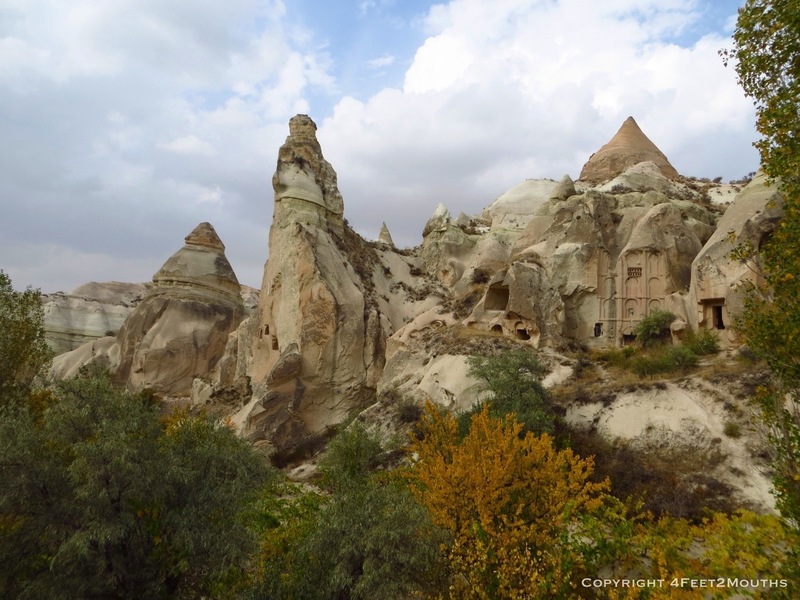 We began our hike at the top of the Red Valley, looped into the Rose Valley and returned to Göreme. 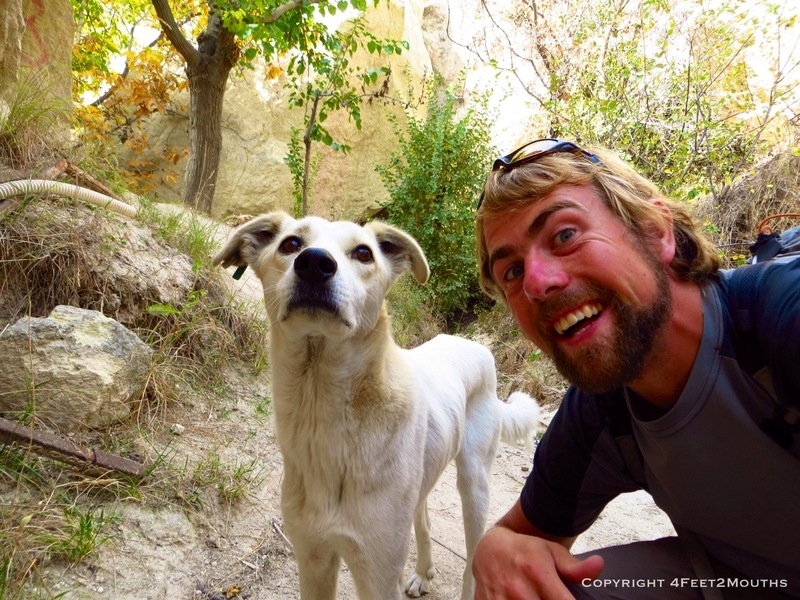 In our first hour of hiking we immediately found a new friend, Spotty, a friendly stray dog that loved to walk and show us around the canyon. There were some sections where we needed to climb a ladder into narrow tunnels. Spotty would pout, we would say goodbye, then five minutes later he would return to us jumping up and down excited that he found another way to the trail. He reminded me of the sweet dogs that hiked with us in South America. The cliffs in these valleys are amazing. Huge ridge lines of rock overshadowed our trail. Looking into the rock face we would see a carved window. 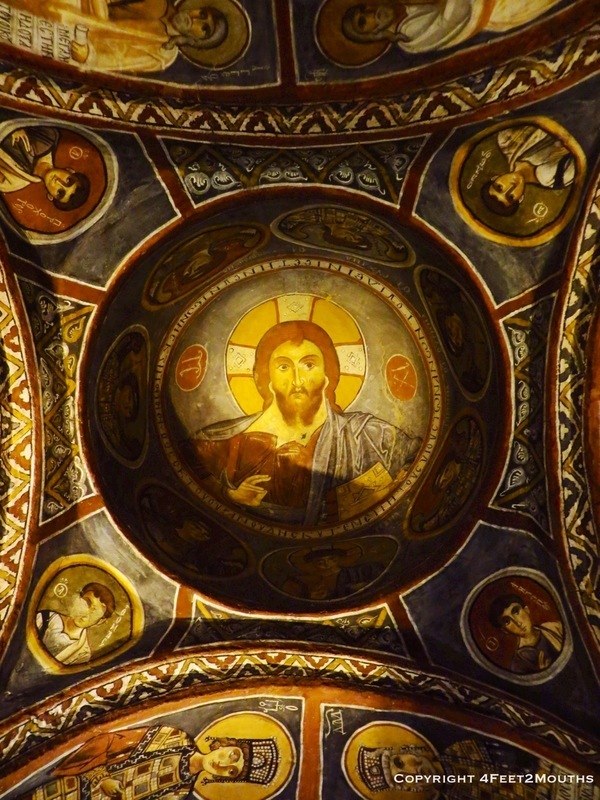 We approached one former habitation to find a beautiful church, full of colorful plastered and painted frescos. We were mesmerized by another church down the trail; an enormous cathedral, a man-made cavern carved out of the rock. Columns and beams were cut from the original rock as one continuous formation. The church was beautiful, welcoming and peaceful. After a few pictures, we continued our walk through the canyon. The colors of rock were fantastic with subtle pinks and oranges contrasted with bright whites and drastic wave-like erosion grooves. 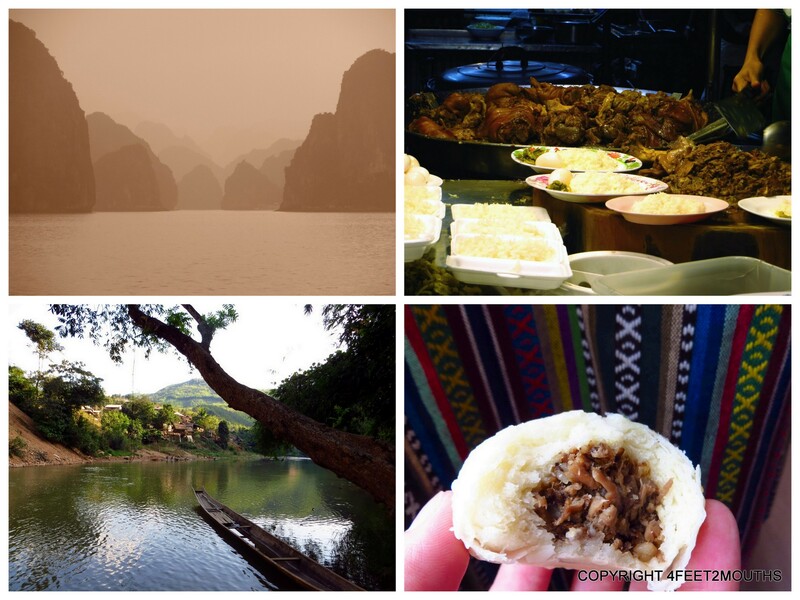 The next day we explored the valleys to the west, the White Valley and Love Valley. 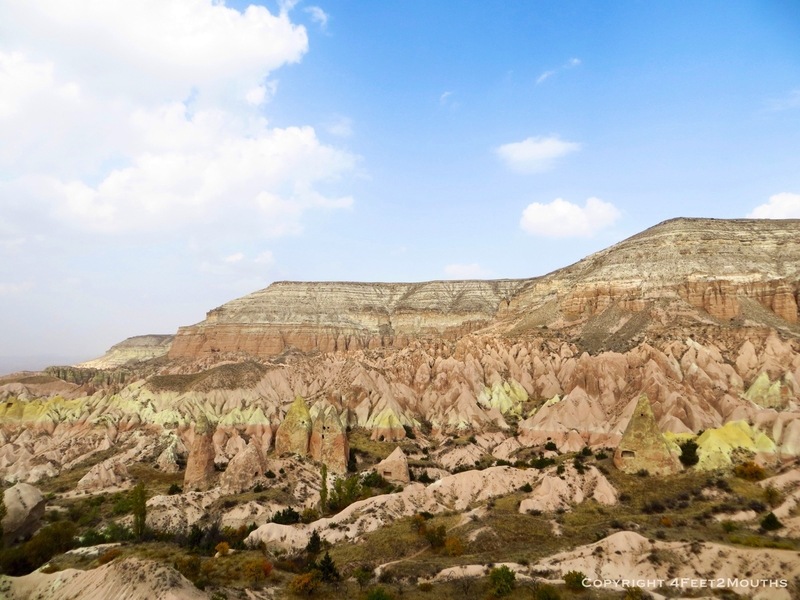 We descended from Uçhisar and into the deep canyon. Within a half hour our perspective was cutoff and hiked deeper into the canyon. Two hours into our walk and we realized that, although beautiful, we had been hiking the wrong canyon and we were lost. 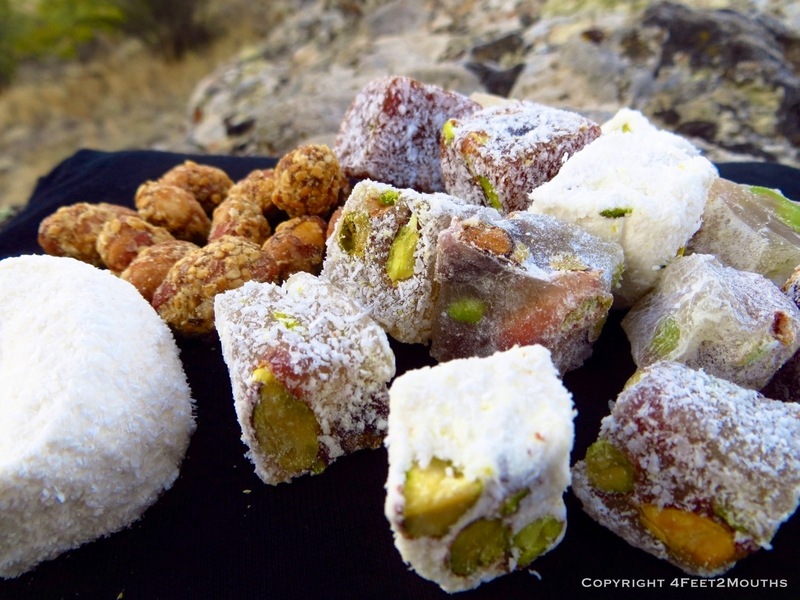 We refueled with some Turkish delights. We crossed a few ridges and found our way to the Love Valley. 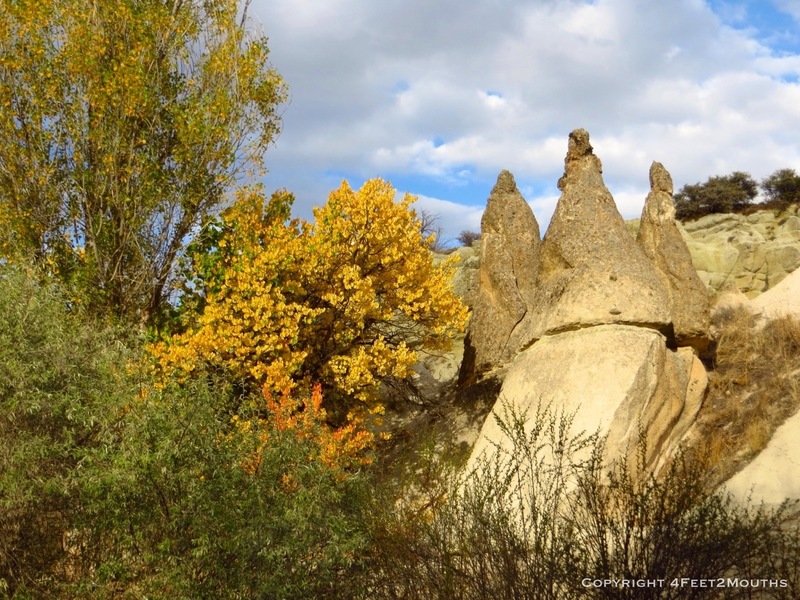 Sixty foot fairy chimneys stood as prominent, and slightly phallic columns in the valley. 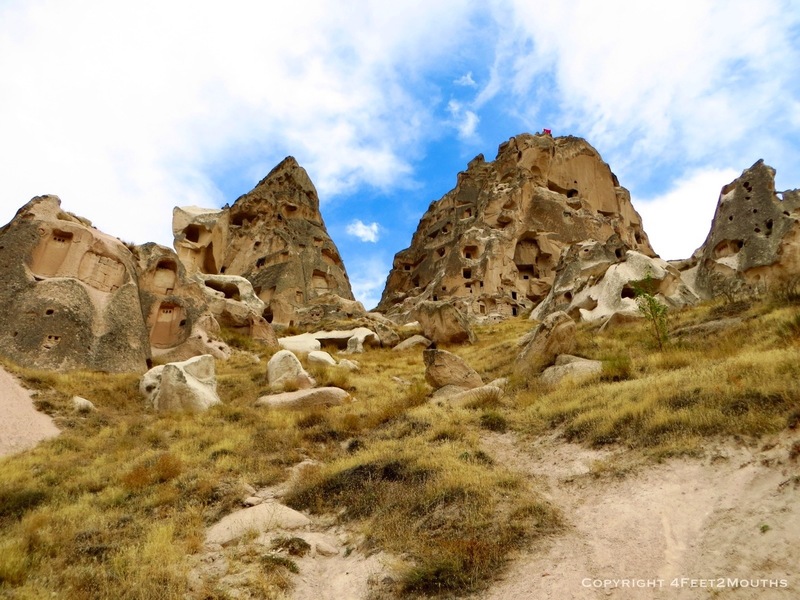 We continued our hike to the adjacent city of Çavuşin, picked up a local bus and returned to Göreme exhausted. With all this hiking our lunch times have been sporadic and our hunger voracious. It seems to be a common occurrence for us to push hard to see sights all day and when we finally stop for a break we are eating lunch at 4 o’clock. 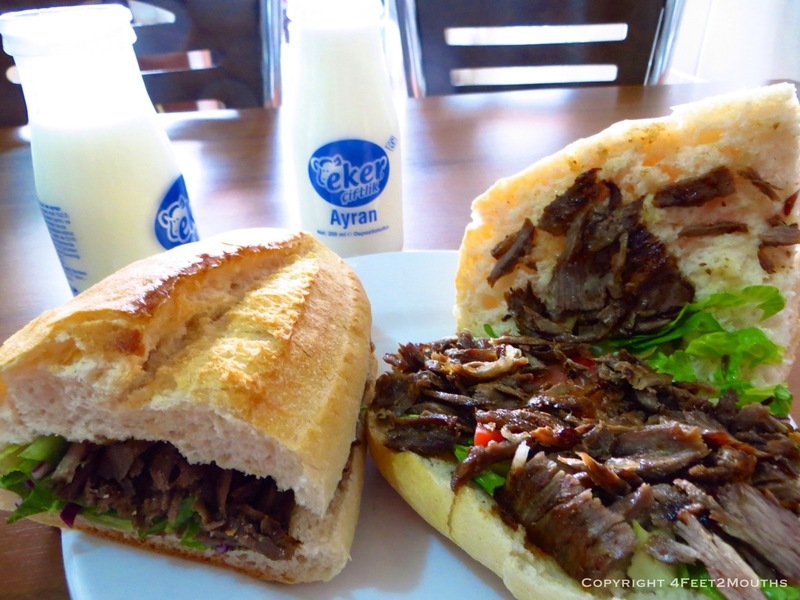 The go-to place for a quick and delicious bite are the many döner kebab stands throughout every Turkish city. Chicken or lamb is layered onto a spike and rotated slowly over a flame until the meat becomes juicy and delicious. The cave buildings are everywhere. One enormous one is Uçhisar castle. 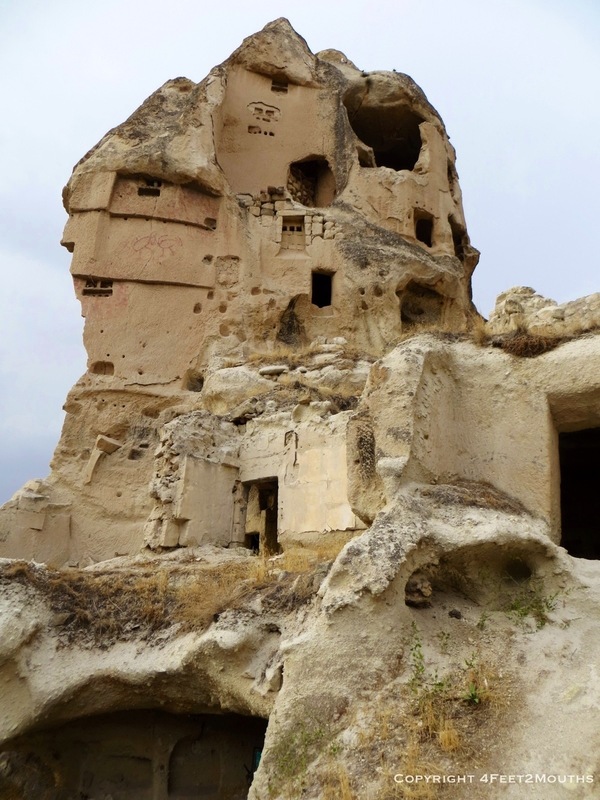 This gigantic rock has been carved with at least ten stories of rooms and chapels. The look-out point can be accessed around the side of the castle and offers excellent views of the nearby cities and valleys. 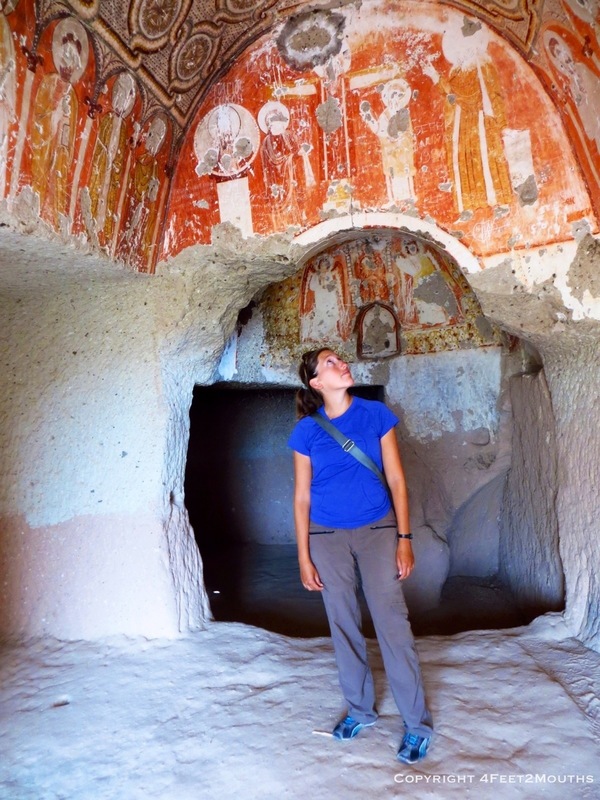 The best preserved churches in the area are in the Göreme open air museum. This collection of eight or so fairy chimneys and cliffs house beautiful chapels decorated exquisitely with colorful frescoes. 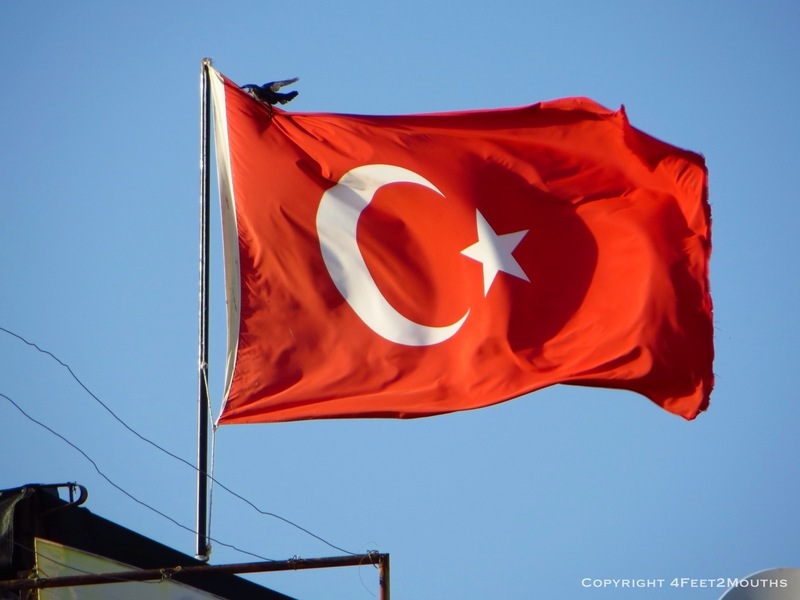 One frustrating part of Turkey has been the constant demand for entrance fees from tourists. I am happy to be a tourist, but frustrated when I am considered a cash-cow. The last time I felt like this was in Cuzco. Of course we payed extra to get into the dark church. Hiding behind one of the columns, I befuddled the security guard and took this photo of the ceiling. Breaking the law for the blog! Deeper into the earth we explored. 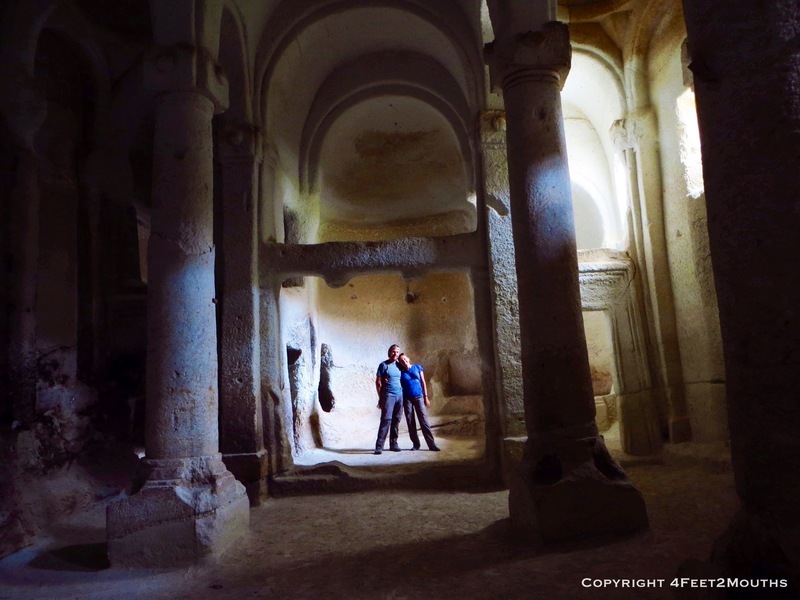 A short bus ride from Nevşehir and we were descending a set of stairs into a underground city of Kaymakli. Eighteen hundred years ago, christianity was just picking up momentum. 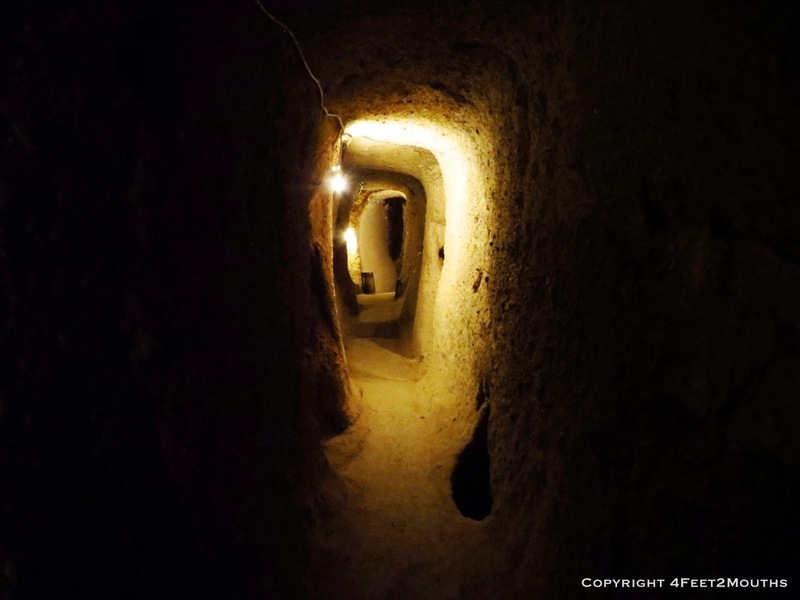 In order to protect themselves the people dug out elaborate tunnels, ventilation shafts and locking doors deep into the earth. We climbed down a stairwell, through a dimly lit hallway and room after room showed a history of food storage, wine making and cooking. There was even a place for livestock to be kept safe. The entrance fee covers a lit path the descends one hundred feet (30m) down through six levels of the eleven that exist. I counted at least six sections of the city that were not lit; I strapped my headlamp on and I climbed into the darkness. I crawled on my hands and knees and eventually the tiny hallway opened up into a room, another hallway and I found a bigger room. Sections of rock were carved out to hold a round door used to block the passage way. Deep and alone and feeling like I was in an Indiana Jones movie, I turned around and returned to Carmen. 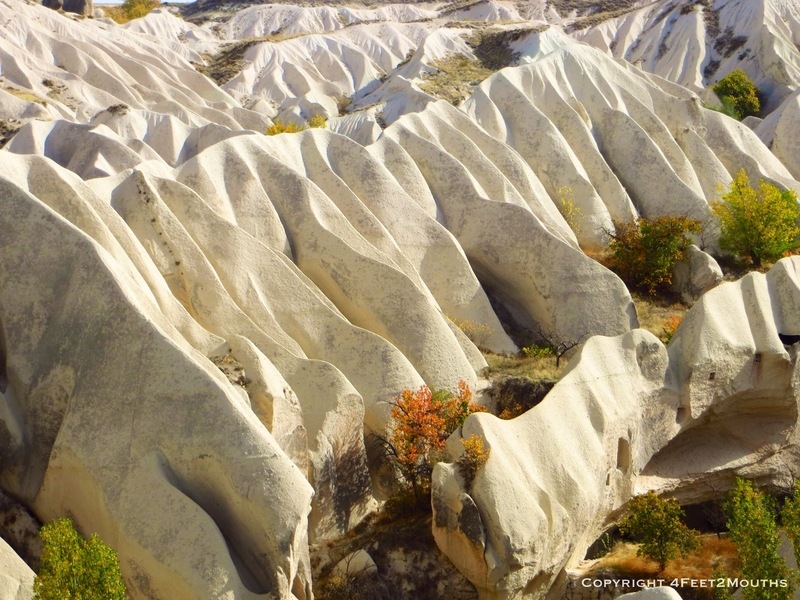 Cappadocia continued to take our breath away. The natural formations of rock alone are spectacular. Combined with colorful balloons, cavernous underground city’s and cave churches makes the region a magical and unbelievable place. 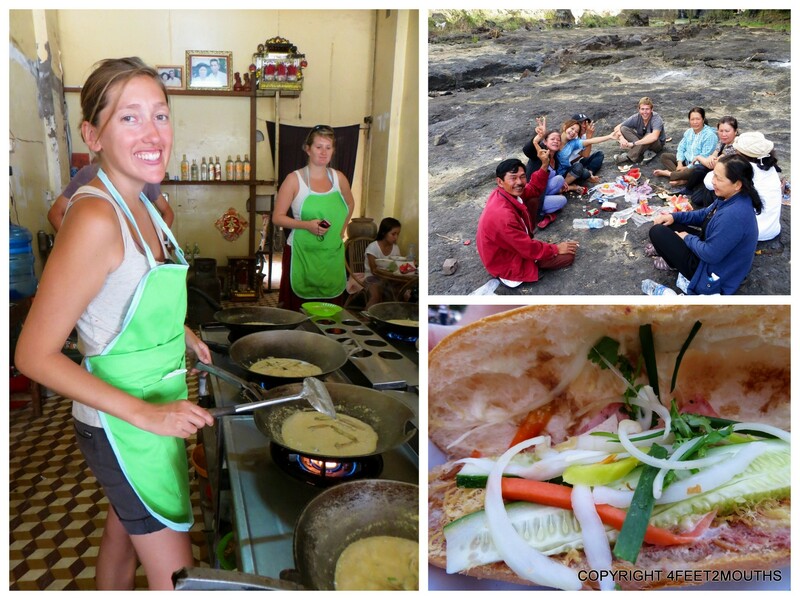 This is one of the best places we have ever been, go here! The sun was setting over rolling hills. I had a wine glass in one hand. The calls to prayer began emanating from minarets throughout the town. It was a perfect moment at our sweet guesthouse in Selçuk. This was our first stop in Turkey and we had received a warm welcome of wine on the hotel’s terrace. 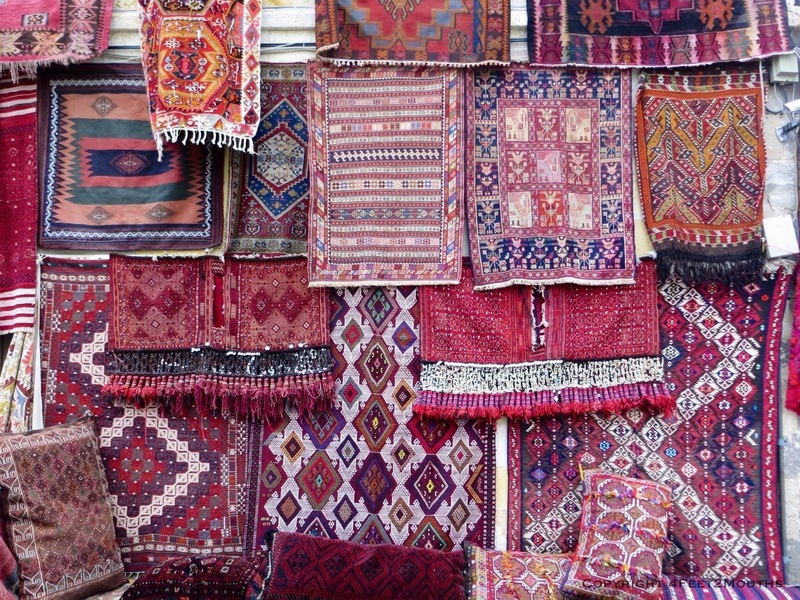 I was immediately enchanted with the Turkish decor of thick carpets, a mix of patterned fabrics and comfy pillows. 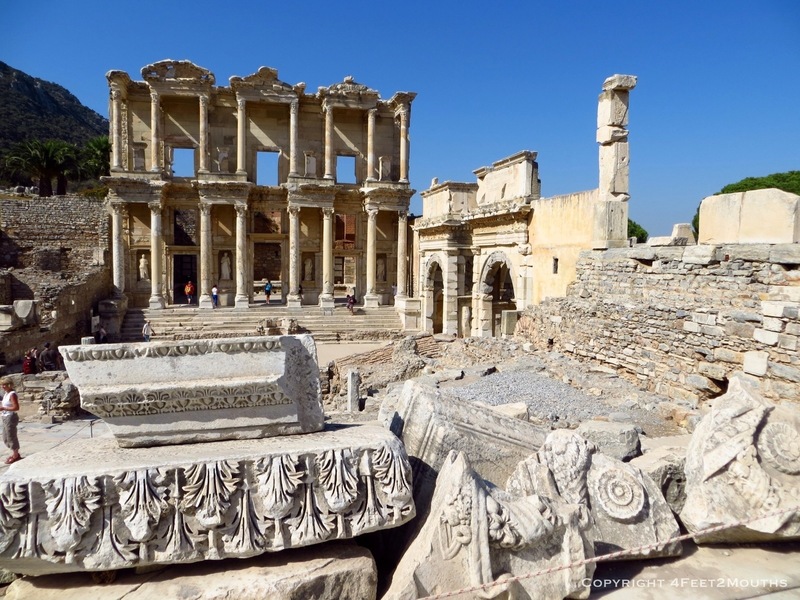 Selçuk is best known for one magnificent, very special sight – the ruins of the ancient Roman city of Ephesus which peaked in the 2nd century AD. This archeological site is up there with the likes of Pompeii in terms of intactness. 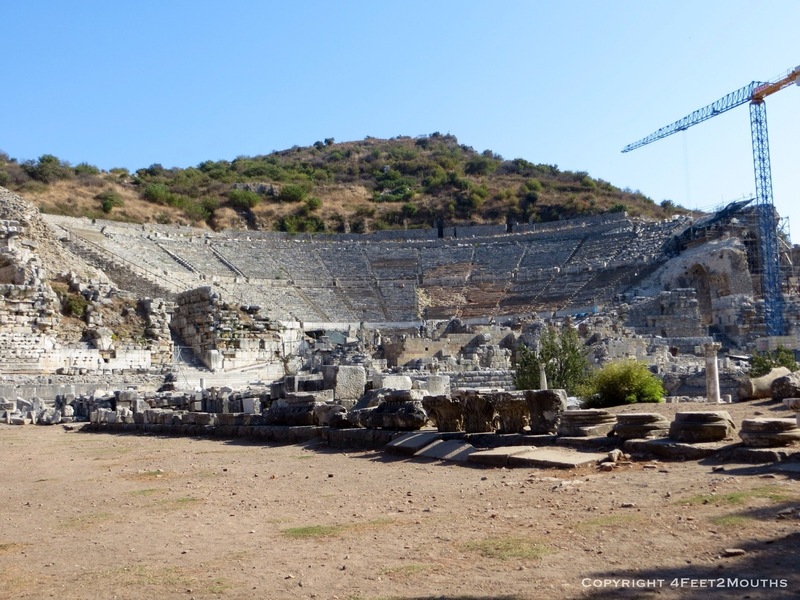 As we walked in I was immediately blown away by the huge theater built into the hillside. It could hold an astonishing 25,000 spectators. This generous capacity hints at the city’s large size, which is estimated at a quarter of a million people. 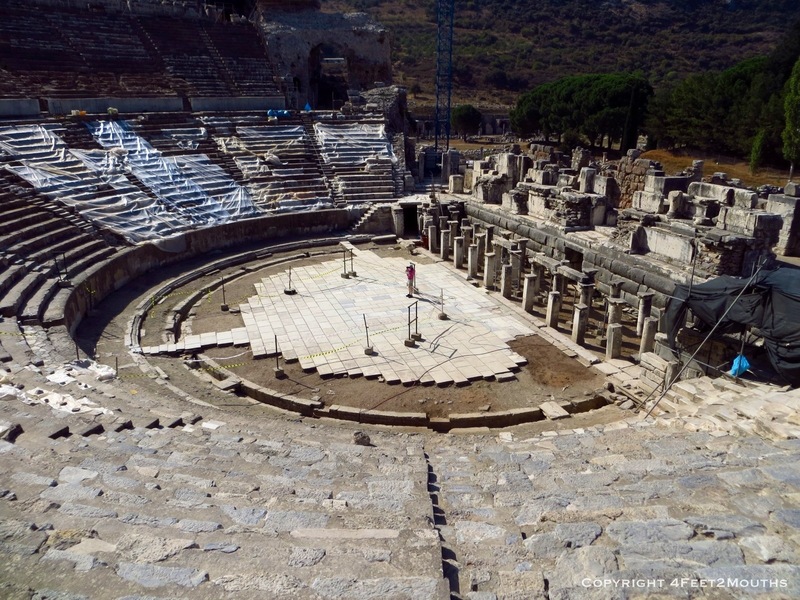 The true star of Ephesus lies just beyond the theater. 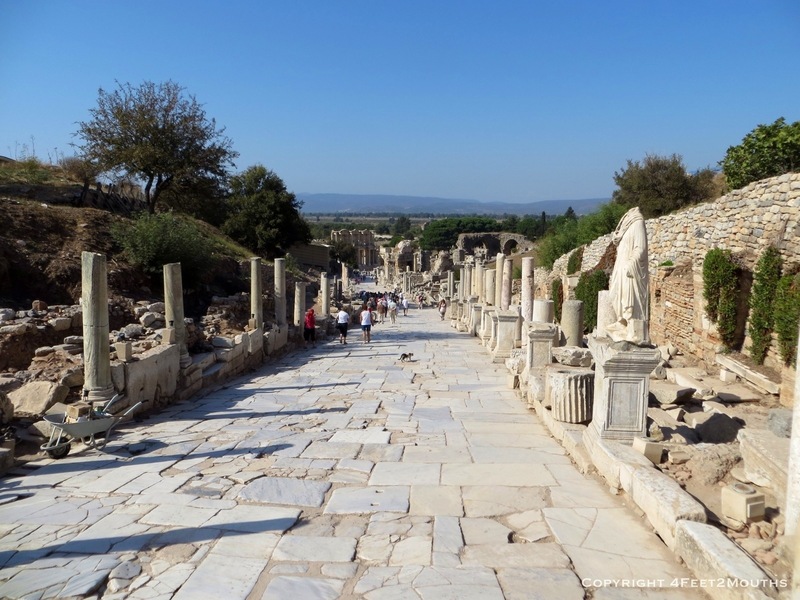 Up a marble path, past the old agora (market) is the Library of Celsus. Based on the intricately carved exterior, I can l only imagine how grand and elegant this three story structure must have been. From the library the main street leads up hill revealing more and more incredible buildings with each step. 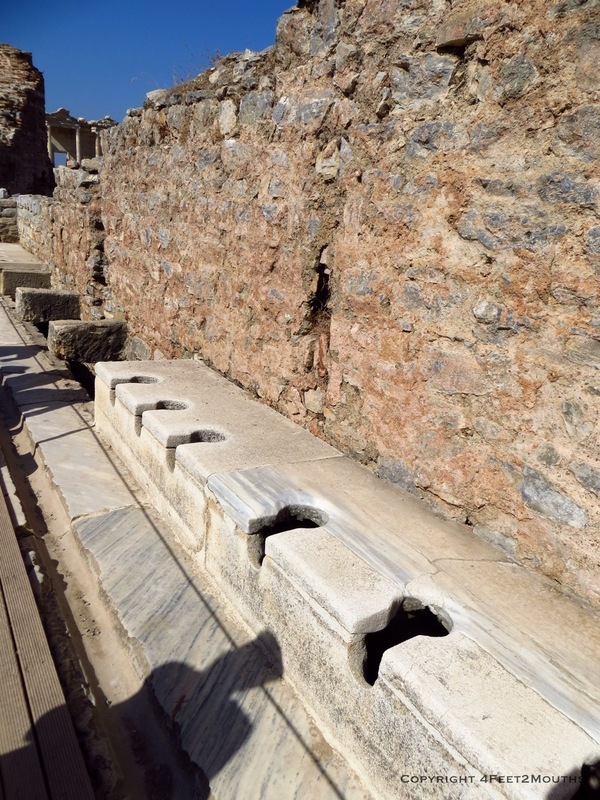 We even found evidence of more mundane spaces, such as the latrine. Advanced plumbing meant waste was swept away quickly. The Romans understood cleanliness thousands of years ago. It amazes me how far down Europe sank in the dark ages after the fall of Rome, when hygiene was practically nonexistent. Also on the main street is a collection of lavish homes of the rich. 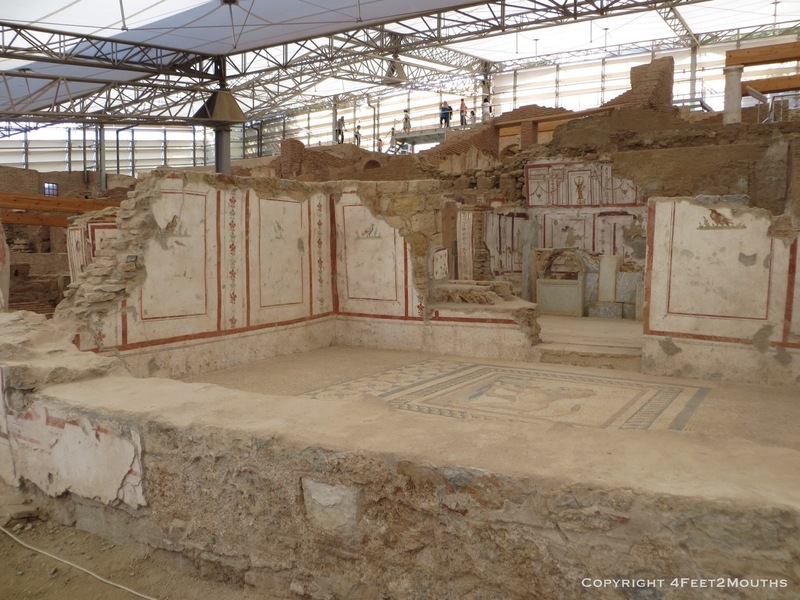 They were large complexes with every inch of wall space frescoed or covered in marble. 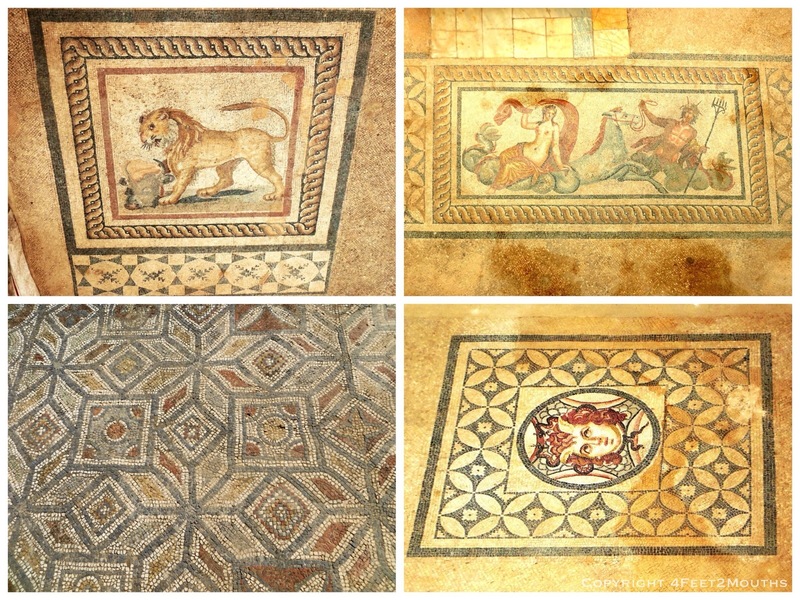 And the mosaics were spectacular, depicting animals or mythical characters such as Medusa or Poseidon. 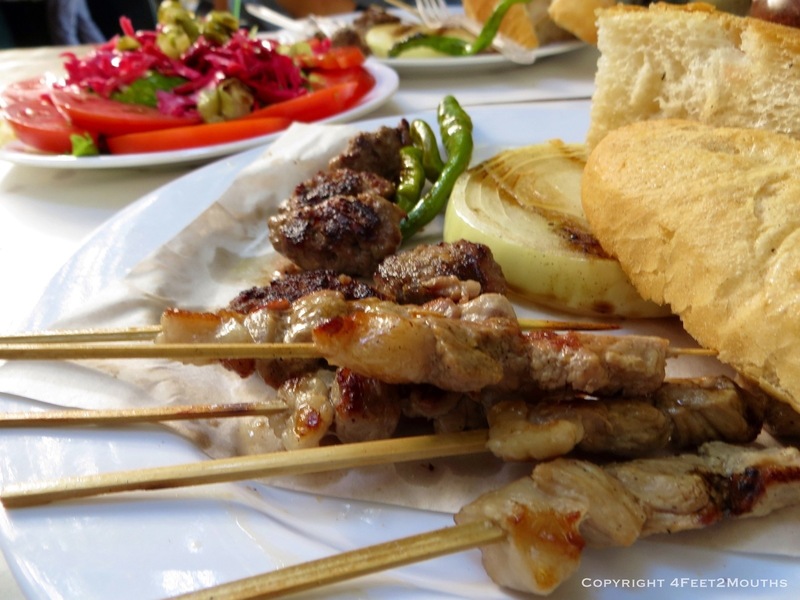 All that scrambling over ruins got us hungry, so our first stop back in town a plate of chicken shish and juicy köfte (meatballs). 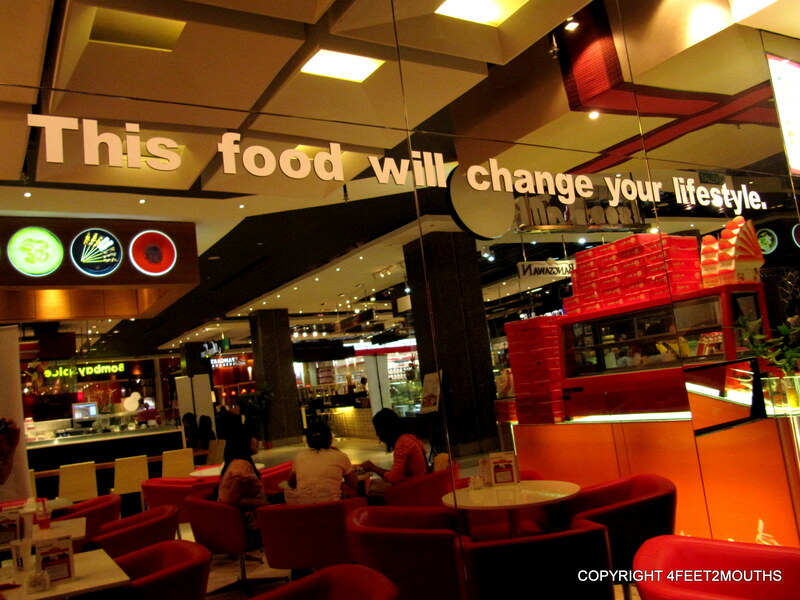 After relaxing at the hotel, we headed out for a simple dinner of Turkish salads. These included stuffed peppers, sautéed eggplant, tangy thin green veggies, tomatoes with green beans and yogurt. 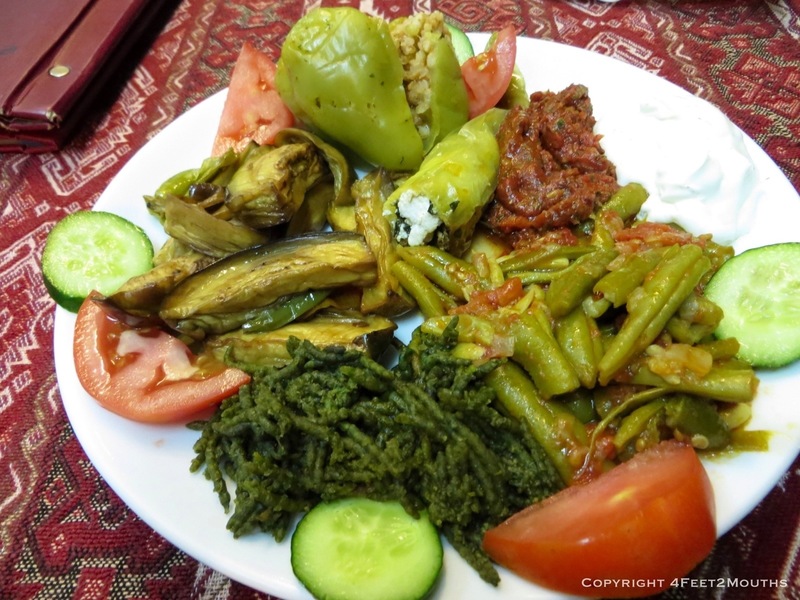 With each new Turkish dish I tried, I was hungry for more. 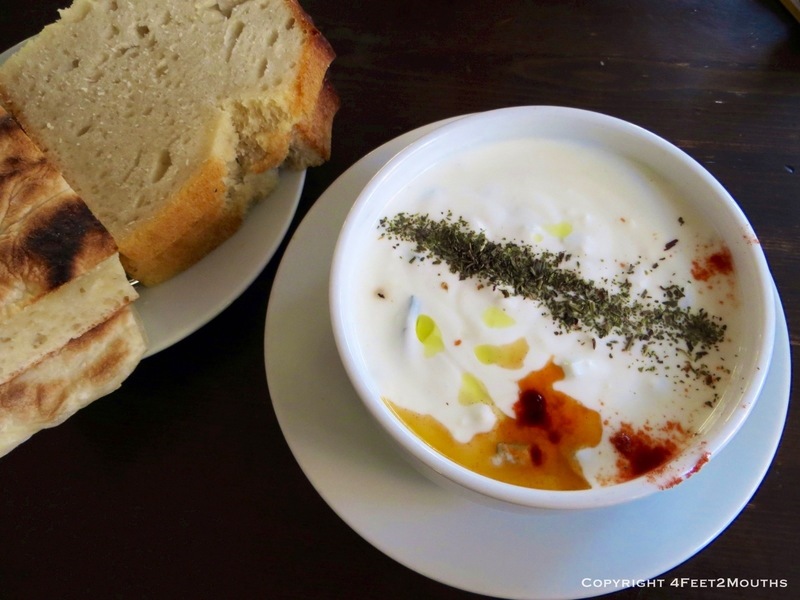 Yogurt is a staple of Turkish cuisine and I love the traditional way to serve it. Cacık is a thinned yogurt mixed with cucumber, garlic, dill and lemon. Used to dip thick, spongy bread it makes for a delicious snack. We enjoyed some as we made our way through the lively Saturday market. For the rest of the day we headed back to antiquity. 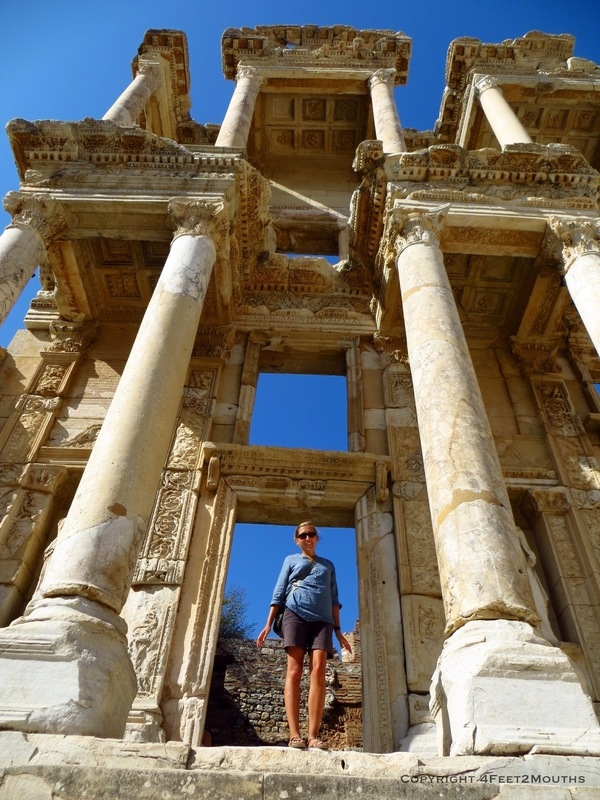 First we visited the one remaining column of the Temple of Artemis. 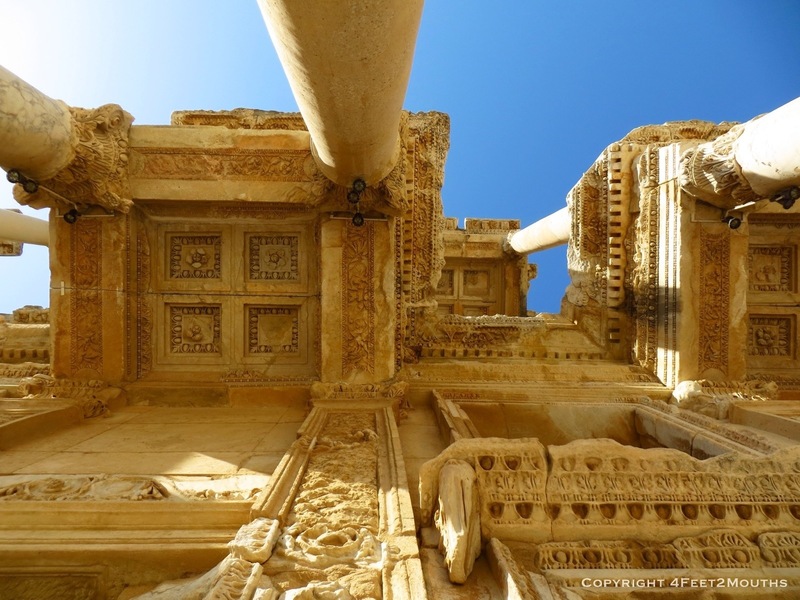 Once one of the seven wonders of the ancient world, the temple once had 127 columns. 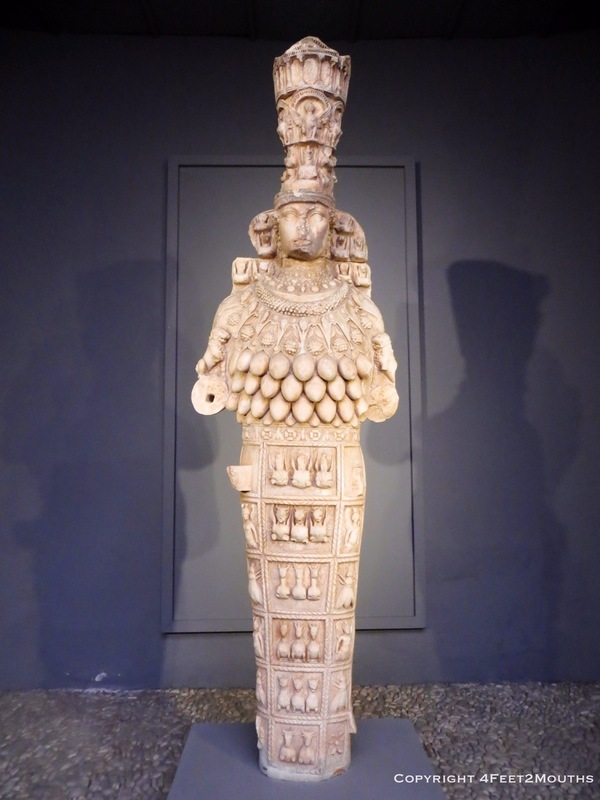 Inside, the giant statue of Artemis a symbol of fertility towered over worshipers. The temple eventually fell into disrepair and the marble harvested for other uses. But the footprint of the structure is still visible and impressive. We rented a scooter to visit one more historical site. 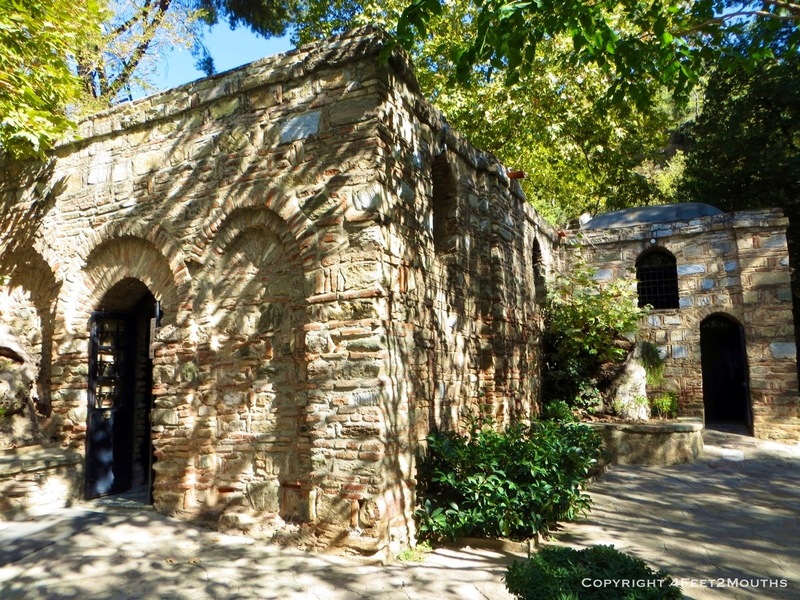 Virgin Mary’s believed final residence is outside Selçuk in a pretty mountain valley. We had expected a spiritual place but it turned out to be a rather simple chapel with one wooden, handless statue of Mary. The government charged to get into the park and it just felt like people went in, lit a quick candle, and left. Definitely not our favorite visit in Selçuk. Another sunset on the terrace made up for it. We were welcomed with another glass of wine and the hotel owners even fixed up Nathan’s shoe that had broken that day. 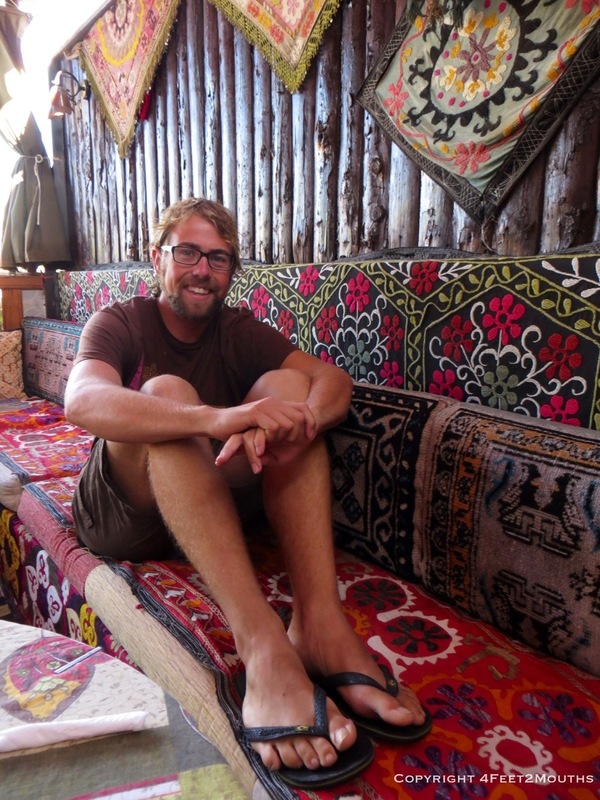 We relaxed, watched the moon rise and got ready for our bus to Cappadocia.